Assemble at War Memorial for 10.45 am. 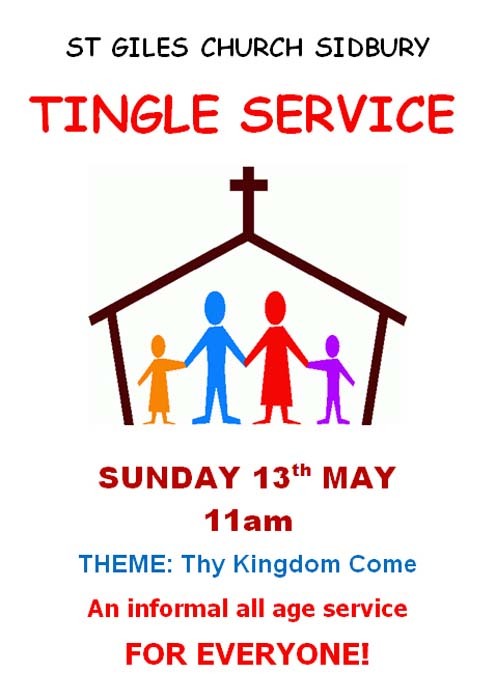 Service at church 10.55 am. 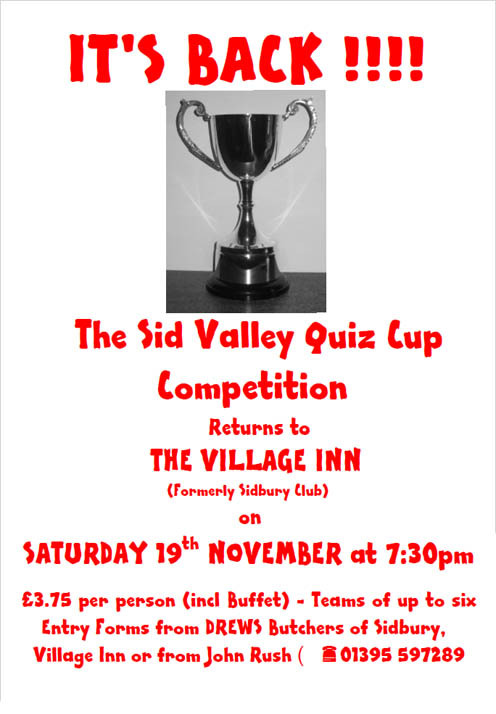 Teams of up to 6 - £3.50 per person to include buffet. Help us bring light and hope to children living in poverty in this country. 'Cellos 4 (Jane Greenwood, Jane Pirie, Rebecca Allnatt & Hilary Boxer) play Bach to the Beatles. Come and pit your wits! All beers just £2.50 per pint! Chris Gradwell (clarinet) and Andrew Daldorf (piano) provide 'Light music to Jazz', a journey from William Walton to George Gershwin and beyond. 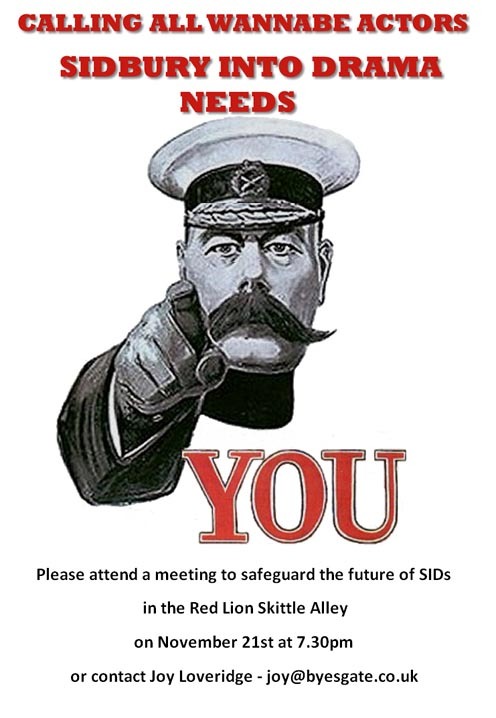 Sidbury Allotments Association Annual Meeting will be held at the Red Lion at 7.30.pm. Live music by Bus Stop Cafe - 5 piece band. 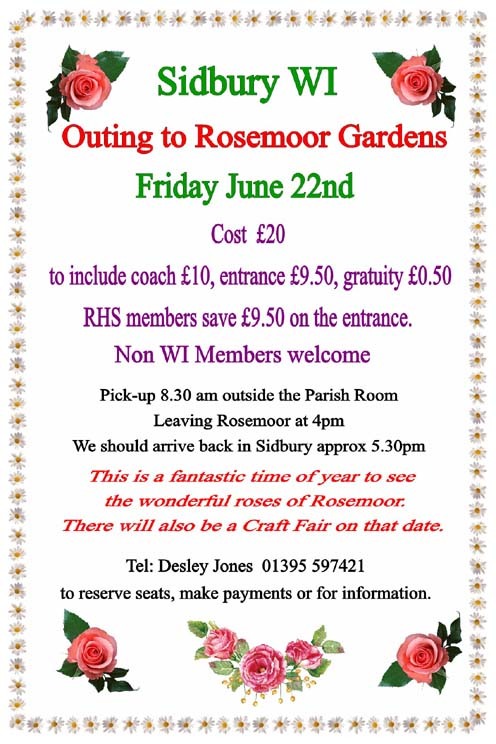 Sidbury Manor and its gardens will be open group visits again this year. Tours are personally led by the owners, Sir John and Lady Cave, and end with a delicious cream tea. 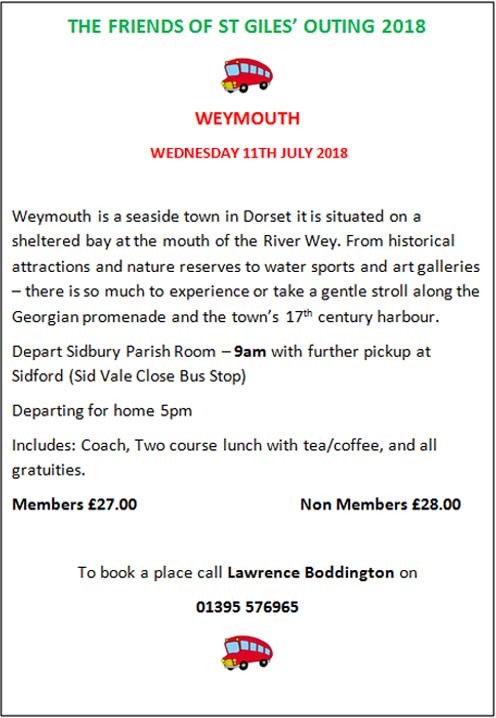 The tour for April 9th is now fully booked but tickets are currently still available for the tour on June 23rd and can be purchased from 'Invitation to View' either through www.invitationtoview.co.uk or by calling 01206 573948. No photography in the house. No dogs. Because our properties are old and fragile, unfortunately we cannot include children under 14. The Beacon Piano Trio consisting of Joyce Clark (piano) Anna Cockcroft (violin) and Ruth Lass (cello) make a welcome return after five years. 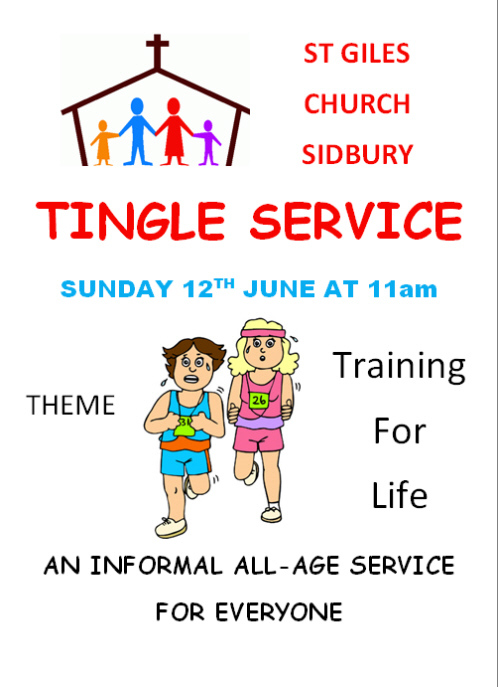 St.Giles' Sidbury and St.Peter's Sidford are holding a Christianity Explored Course at various venues. 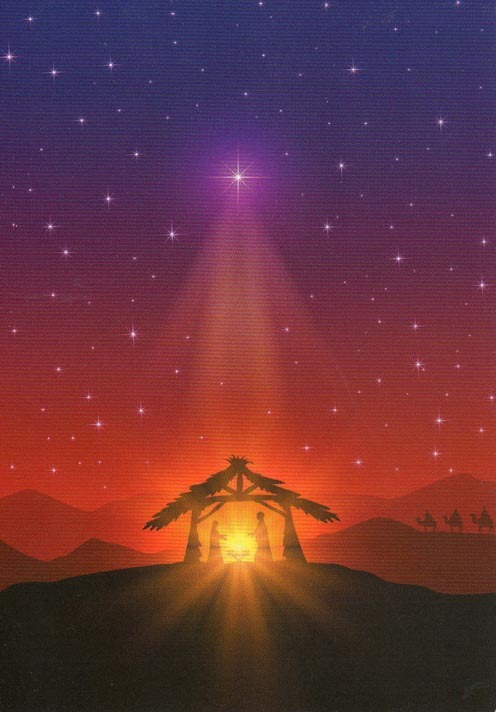 Time and space to think through who Jesus is and why it matters. 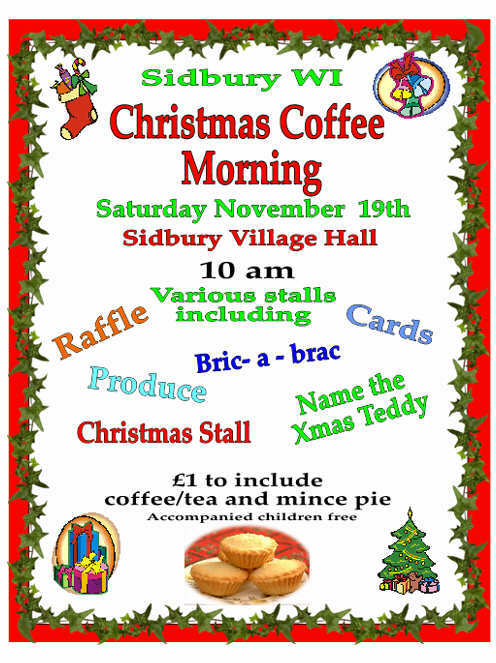 Entrance £1 to include coffee and biscuits. 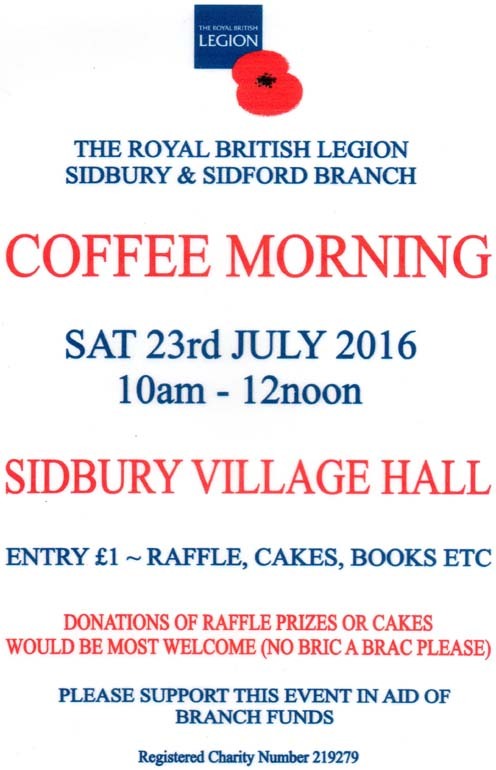 Sidbury with Sidford Mothers' Union invite you to a Cream Tea in Sidbury Parish Room. 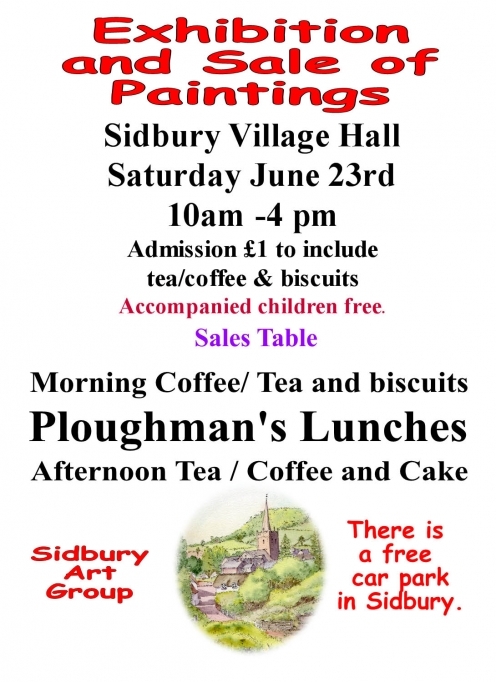 Morning Coffee, Ploughman's lunches, Afternoon tea and cakes, Sales table. 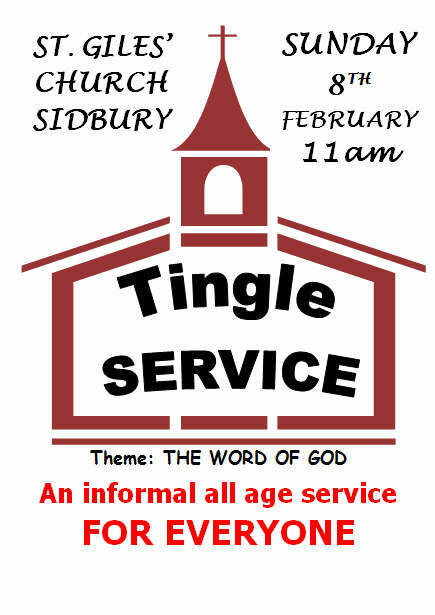 Entrance £1 to include tea/coffee and biscuits. 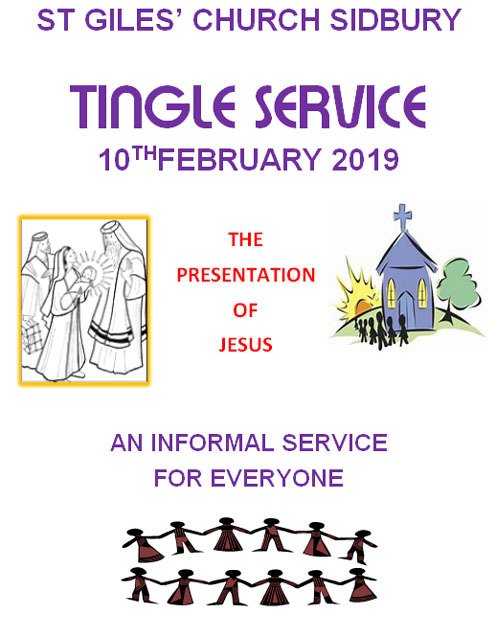 Our group meets Thursdays 10 - 12 in the Parish Room and we currently have vacancies. 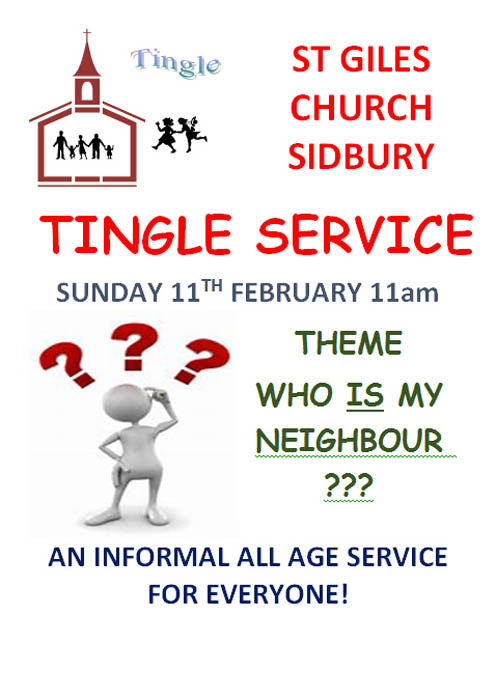 Come along and see if you would like to join us. Part of the NGS Open Gardens For Charity scheme. 25 year old garden carved out of woodland and meadows, built on hillside. Rhododendrons and wisteria, bluebells and roses. Some herbaceous around the house. Small pond and bog garden. Splendid views over Sid Valley. The essence of peaceful Devon countryside. Variety of home made cakes. Juices, teas and coffees. Beautiful terrace to enjoy tea or conservatory if wet. 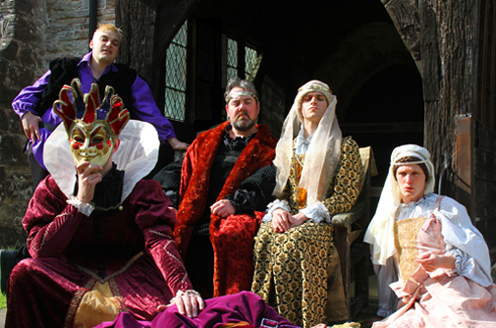 Come to Sand in Sidbury and enjoy an authentic Tudor meal in the beautiful Elizabethan Grand Hall. The six course meal includes the choice of three puddings and will give the flavour of the era. Take the opportunity to dress up and have a fun time. 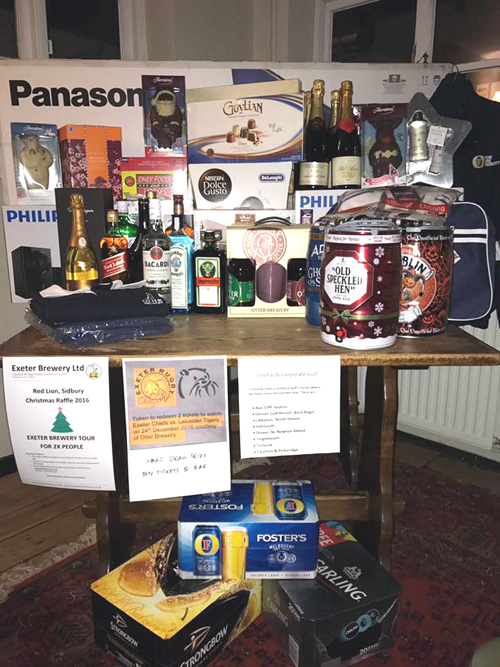 All proceeds go towards Tanya's Fastnet challenge. The tour for June 23rd is now fully subscribed but more tours will be available in 2016. Visit Poole Pottery, stroll along the bustling quayside, explore Poole's historic Old Town and follow the Cockle Trail. Visit Poole Museum or Dolphin Shopping Centre. 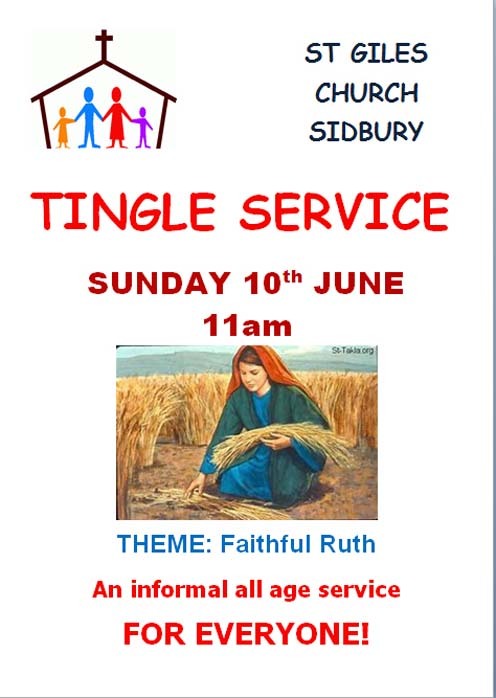 Departing 9.00 am sharp from outside the Parish Room. Lunch at the Thistle Hotel 12.30 pm for 1.00 pm. Depart for home 4.15 pm. Price £24 per person including coach journey, lunch and all gratuities. 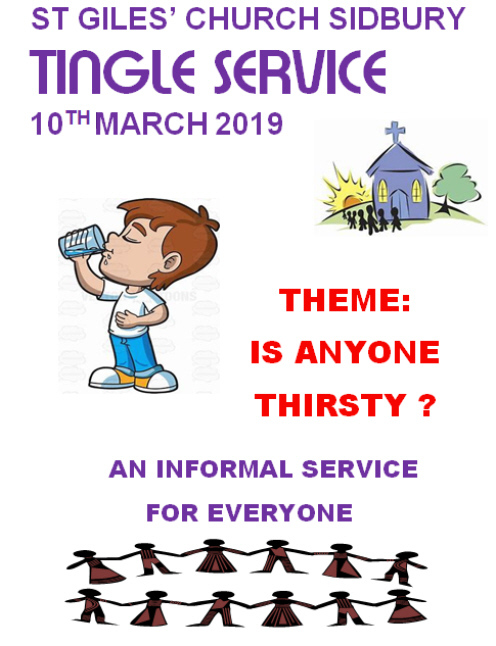 Non members welcome but priority will be given to members. Please telephone Lawrence on 01395 576965. W.I. members please speak with Monica Hennessy. The tour guide will take you back over a thousand years, and even earlier if you visit the 7th century Saxon crypt, one of only six to be found in the whole country, dating from around AD 680. From its Saxon beginnings to the present day, it is not only a living record of our heritage; it is also a beautiful church in its own right, featuring fragments of medieval wall painting, a painted gallery, a number of high quality Victorian stained glass windows, and seven intriguing wooden roof carvings of the Green Man. The tours start at 2.30 pm and a visit to the crypt at approximately 3.30pm. bring your own seating & refreshments. 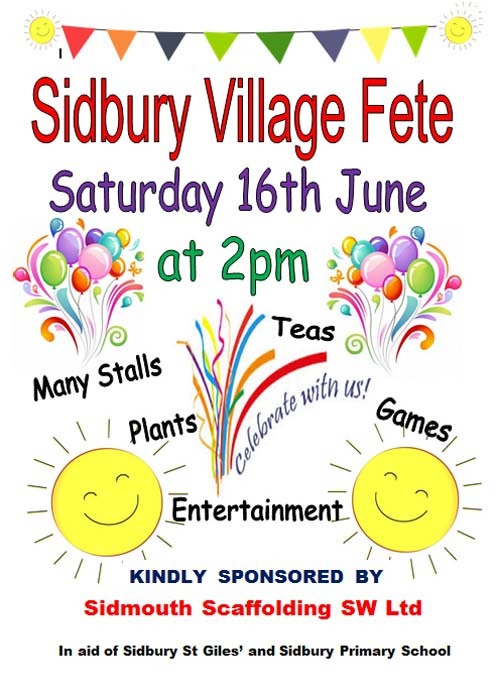 You are invited to a "Blooming Great Tea Party"
We would like to invite all Scarecrows in Sidbury to come out of hiding for Sidbury Fair Week! All Scarecrows will gather at the Parish Rooms on Sat 12th September between 10am and 12 noon where there will be people on hand to help you find a place in the village centre to make your Scarecrow comfortable. Prizes given for the best Scarecrow in adult and children's classes. 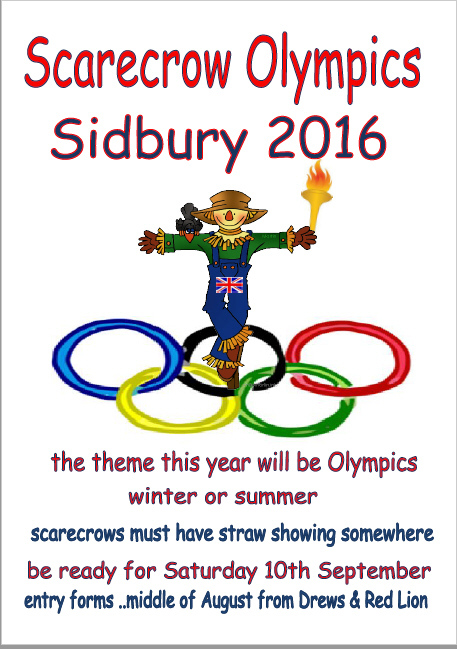 Anyone thinking of having a Scarecrow will be able to get more details from Drews Butchers, the Red Lion or Sidbury Club. Any enquiries to Marion Clarkson: 01395 597432. 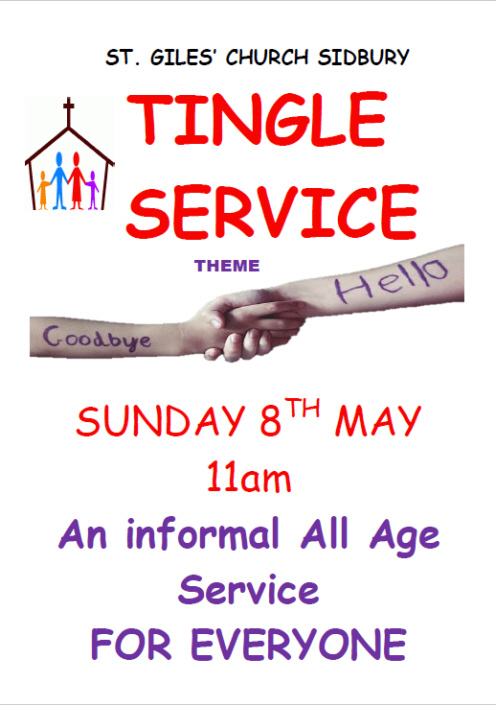 * Please feel free to 'come and go' at any time during the service. Do you have any interesting photos of plants, and/or animals which can be included in this annual competition and can you think of a witty caption to accompany your entry? Over 80 separate entries were submitted last year and we are hoping to match or exceed this number this year. 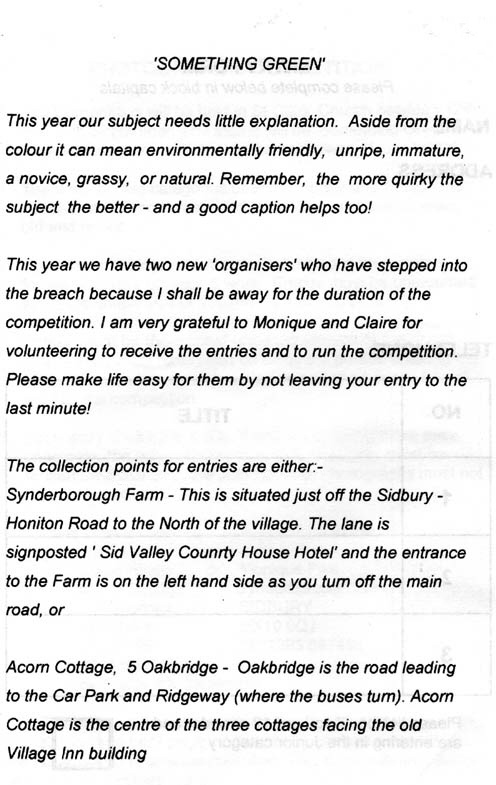 Sidbury Fair Clay Shoot is held in the magnificent setting of Sidbury Manor Grounds by kind permission of Sir John Cave. We call this a 'Country Clay shoot' because the targets are geared to a day's shooting in the field rather than the normal type of target you would find at a clay club. We endeavour to put on driven targets for the peg shooter, a high quartering pheasant or something akin to a Woodcock jinxing through the trees, a pigeon dropping on to decoys or even a bolting rabbit if site conditions allow for the local syndicate gun or walked up shooter. So if you've not had your gun out since last shooting season come along and have a warm up before the start of the new season, we try our hardest to cater the layout to most abilities. We make the day as informal and relaxed as possible, on hand will be two ex-county shots and a CPSA/ICSI qualified instructor, all have shot both game and clays for many years, they can assist in most things shotgun shooting related from technique to cartridge selection if required, any assistance is given free of charge. The layout is shot in rounds of 25 off 3 stands with a buttoner and scorer to act as your guide, the cost of which is £10 for both 25 cartridges and 25 clays. For the competitive amongst you we do give out two trophies at the end of the day one for 'High Gun' the highest overall score, and a 'Farmers Trophy' for the best score by a novice or game shot. For the complete novice we also provide a have a go stand with limited one to one coaching, the cost of this is £5 for 10 clays, 10 cartridges, a loan gun and all personal protective equipment required (eye and hearing protection). The event is registered with the police under a section 11 and we have cartridges available for use on the layout only, if you bring your own cartridges, fibre wad only and nothing larger than 28 gram 7.5's please, plastic wads and heavier shot cannot be used, there will be no exceptions on safety grounds. If you don't want to shoot but would like to know more please just pop up and have a natter and a cuppa with us. 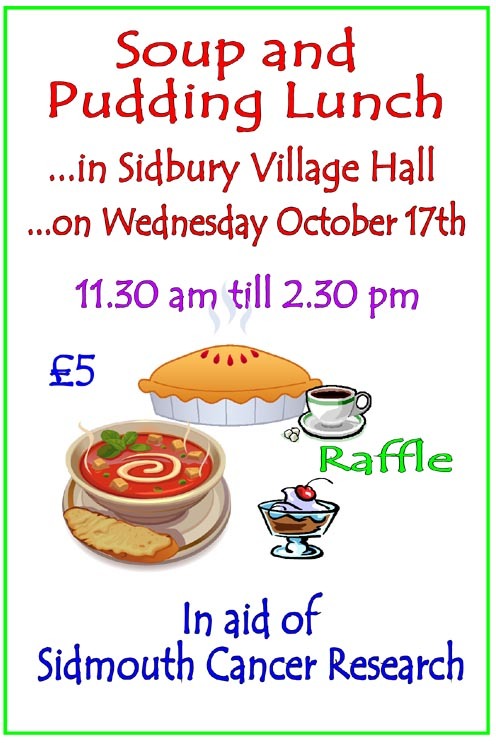 The Old Coach House Kitchen would like to invite you to join us for dinner at Sidbury Village Hall. Tickets charged at £22 per person. For menu and booking details download the pdf file here. This is going to be a great night based around the rugby and Halloween! 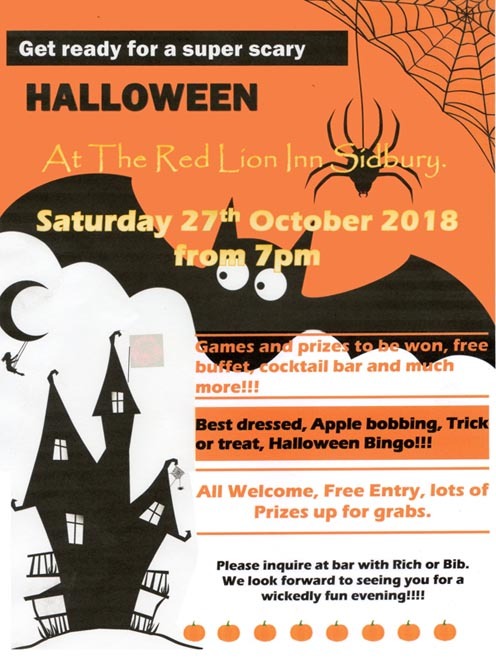 So why not dress up and join in the scary family fun night in Sidbury! Live music from 12 pm. Visiting speaker - Stuart Raine speaking on the subject of Jewish Wedding and the role of Women in Judaism. 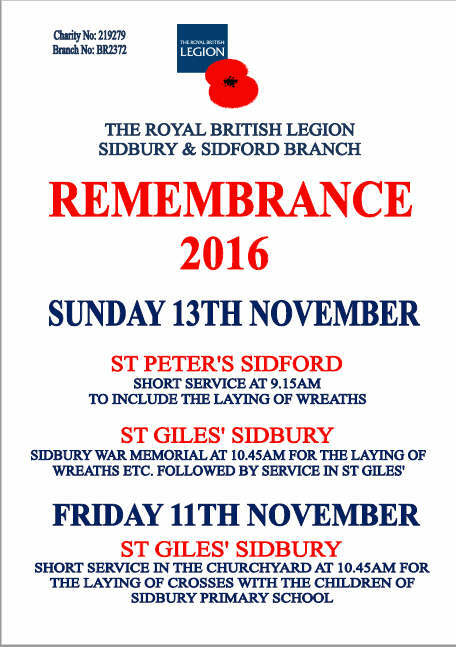 Sidbury War Memorial at 10.45 am for the laying of wreaths. 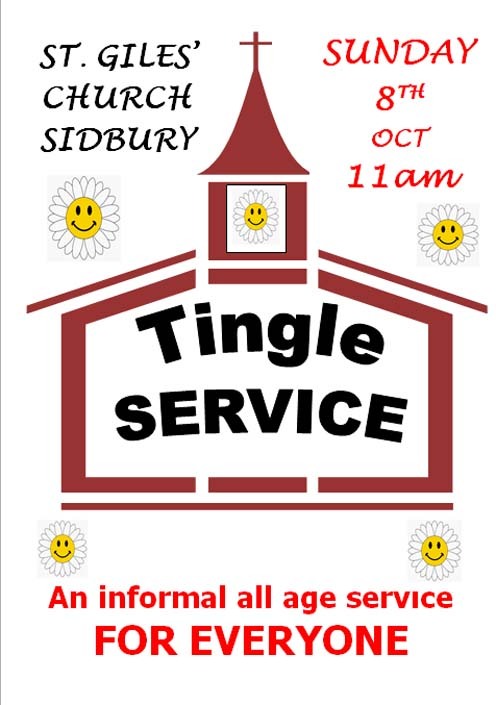 Admission £1.50 to include a cup of tea and a cake. 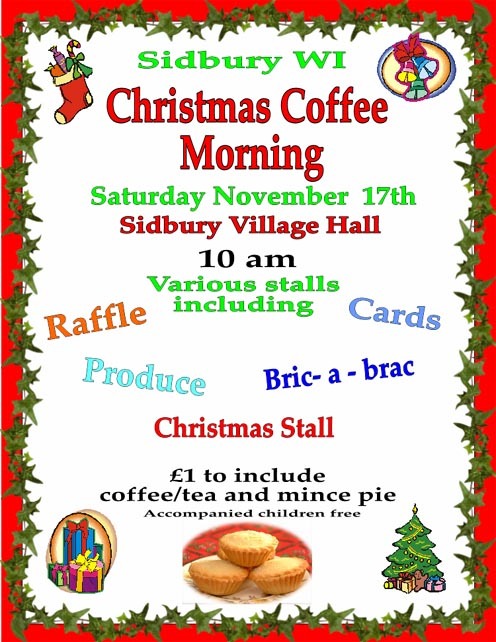 Various stalls including Cards, Bric-a-Brac, Produce, Raffle. A cheque will be presented to the Admiral Nurse Campaign. 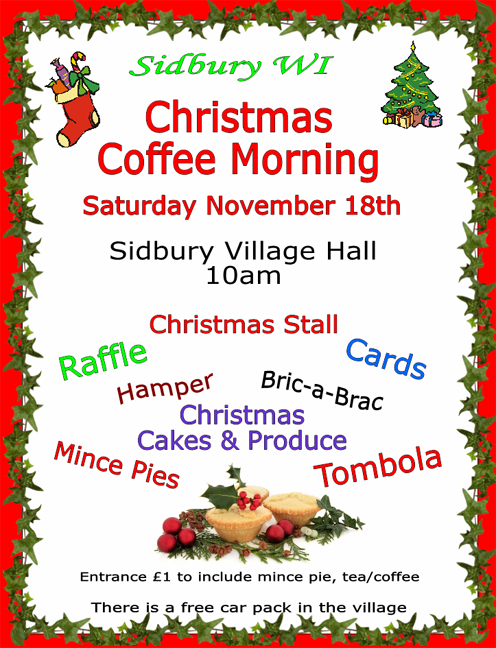 Entrance £1 to include coffee/tea and mince pie. Visiting speaker - Yvonne Davies speaking on the subject of Floral Christmas Decorations. 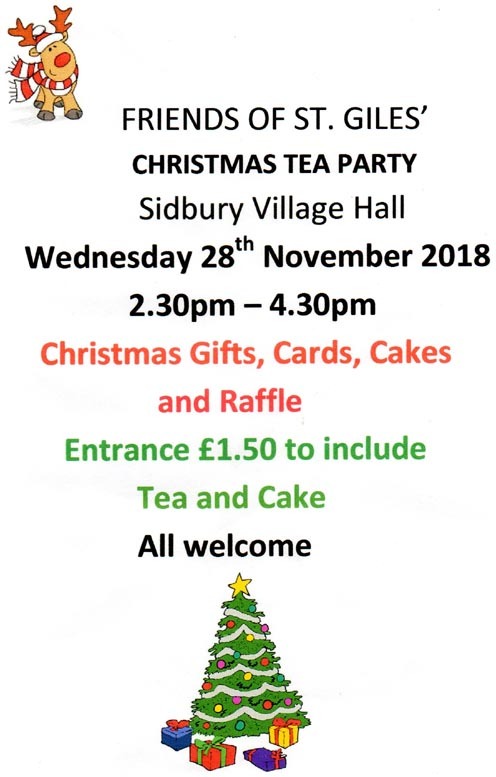 The Old Coach House Kitchen would like to invite you to join us for Christmas dinner at Sidbury Village Hall on Friday 4th December. Doors shall open at 7 for a 7.30 start. Tickets charged at £18.95 per person. For bookings, please either contact us via our 'Pop Up Restaurant' facility at www.tochkitchen.com or email theoldcoachhousekitchen@hotmail.co.uk. 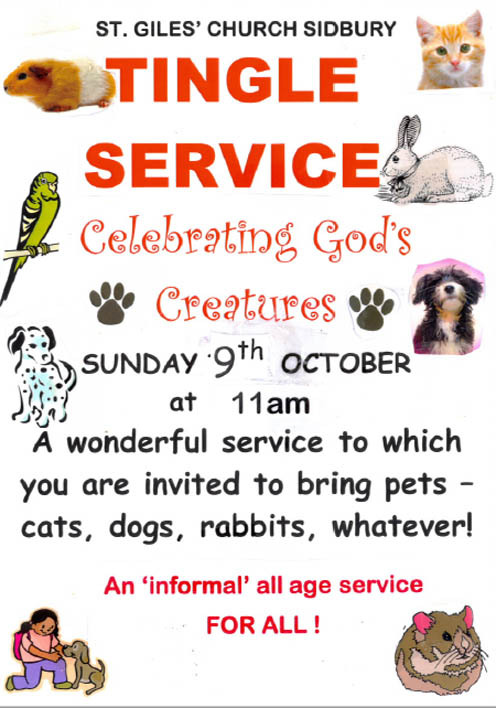 Please include number in party, full names of those wishing to attend and their menu choices. Licensed bar will be provided. Doors to close at 10.00pm. 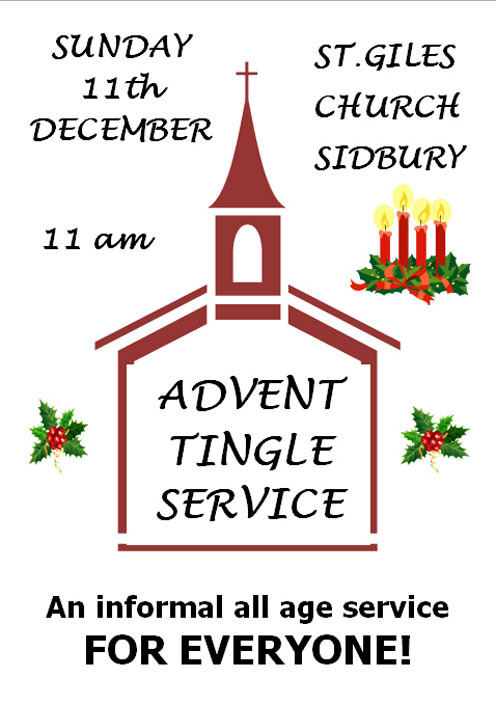 Sing carols with us at the church door. 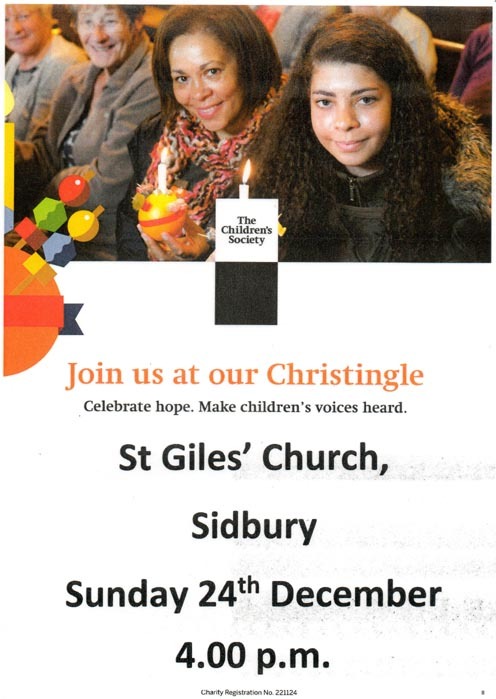 Come along and start the Christmas celebrations with an informal fun evening singing your favourite carols - bring along any Christmas readings we could share in between the songs and with the help of an odd glass or two to lubricate the voices - a perfect way to get into the Christmas spirit. Visiting speaker - Christine Wallach speaking on the subject of Cast Out and Set Free. 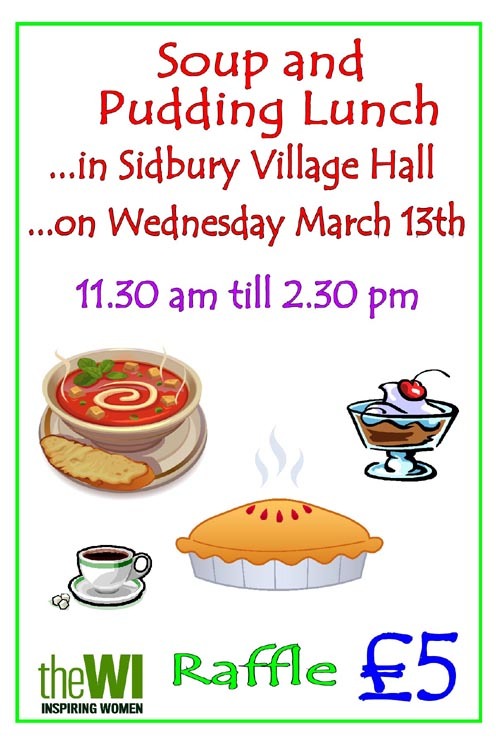 Sidbury Post Office re-opens today and every Wednesday thereafter. Visiting speaker - Joyce West speaking on the subject of Walking with Lions. Visitors are welcome at our meetings. 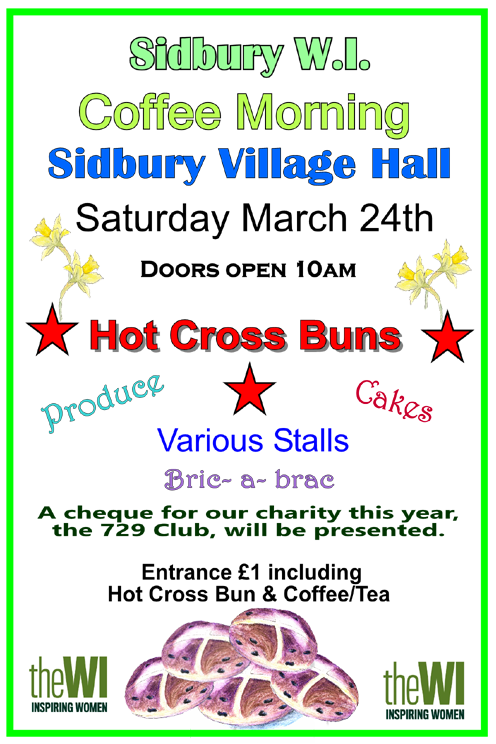 Entrance £1 to include pancake and tea/coffee. 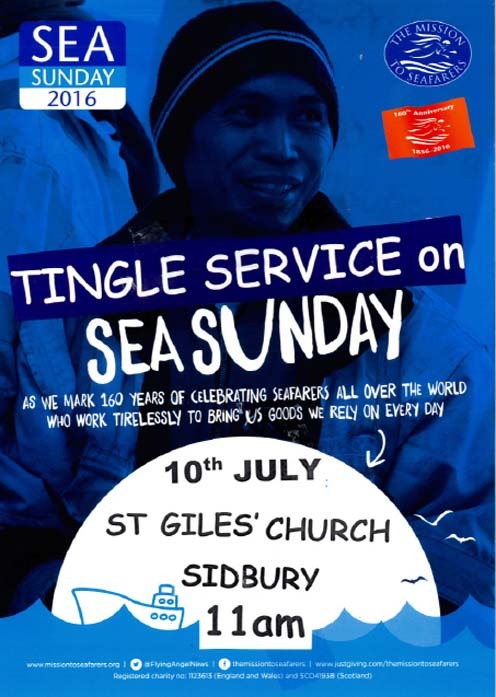 Tickets on the door (including refreshments) in aid of St. Giles' Fabric Fund. 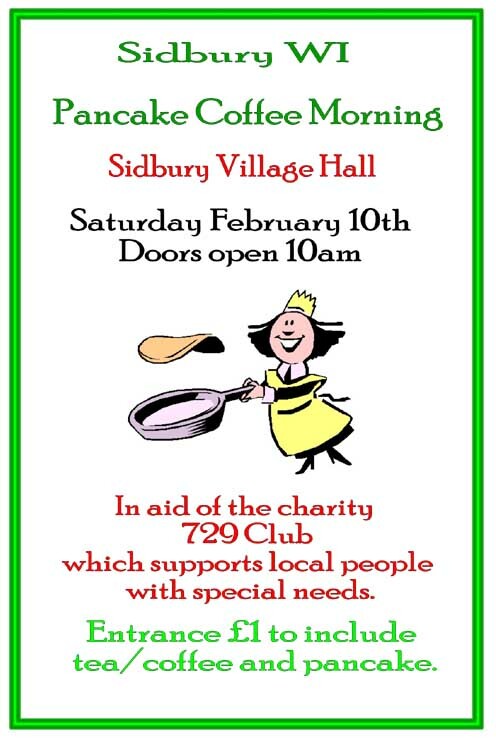 A flipping great time will be had on February 16th when Sid Valley Rotary Club again stages the annual pancake races. As before, the event will be held on the Esplanade opposite the Elizabeth Hotel with races for both adults and juniors. Races for juniors start at 2-30pm with free entry for all competitors. 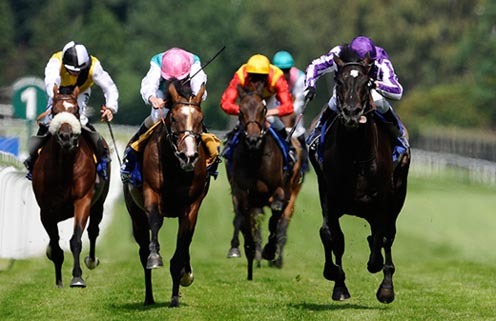 The adult racing, competing for the prestigious "silver pan", begins at 3-00pm. The cost of entry for a team of four is £20. 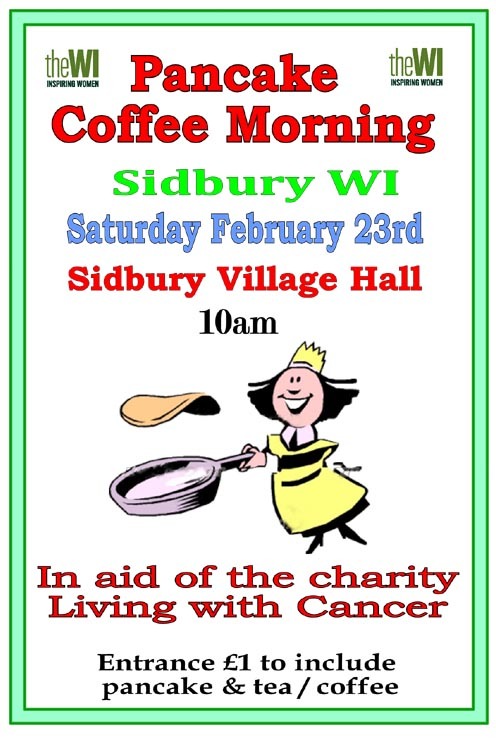 Entry forms for adults will be available on the day or by email to pancake@sidvalleyrotary.co.uk All proceeds will be donated to Rotary childrens' charities. Residents have until Wednesday (March 2) to get their nominations in for a candidate to join Sidmouth Town Council. The new councillor will fill the vacancy left by the resignation of David Addis last month, and will join Councillor John Hollick in representing the village. If the ward is uncontested, a new member will be seconded onto the council. Nomination papers are available from the returning officer at Council Offices, Knowle, Sidmouth, EX10 8HL, and they should be sent to the same address by 4pm on Wednesday (March 2). Hats to be worn - free glass of bubbly on entry, canapés, licensed bar, photo booth, BK Disco. Please bring your annual subscriptions. 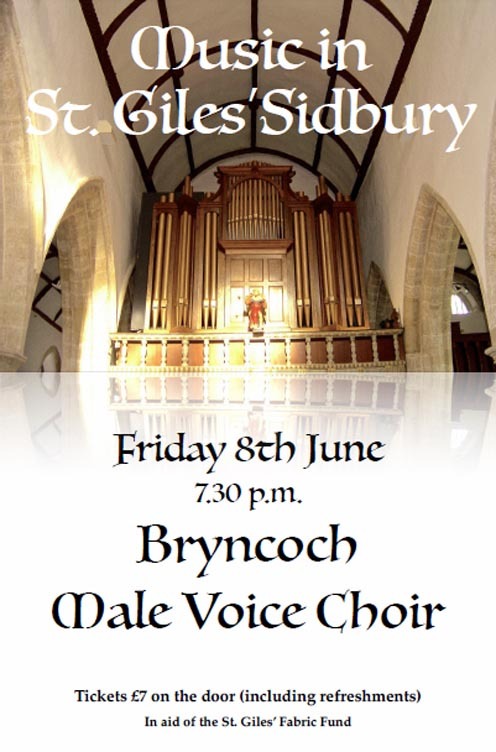 Tickets £7 on the door (including refreshments). 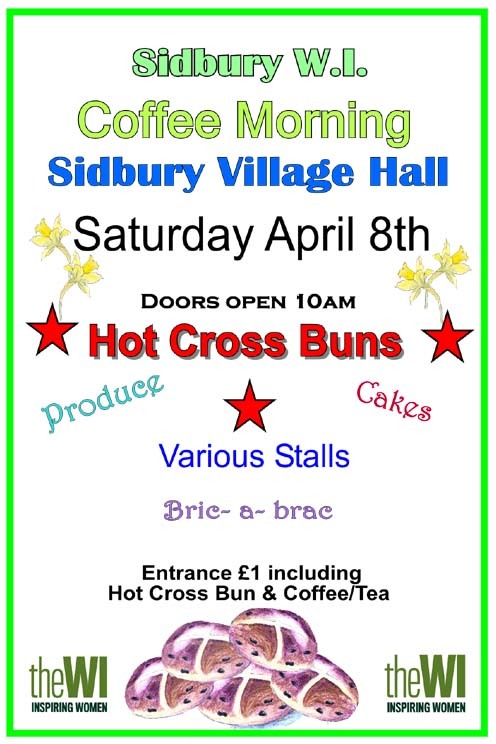 Produce, cakes, various stalls, bric-a-brac. 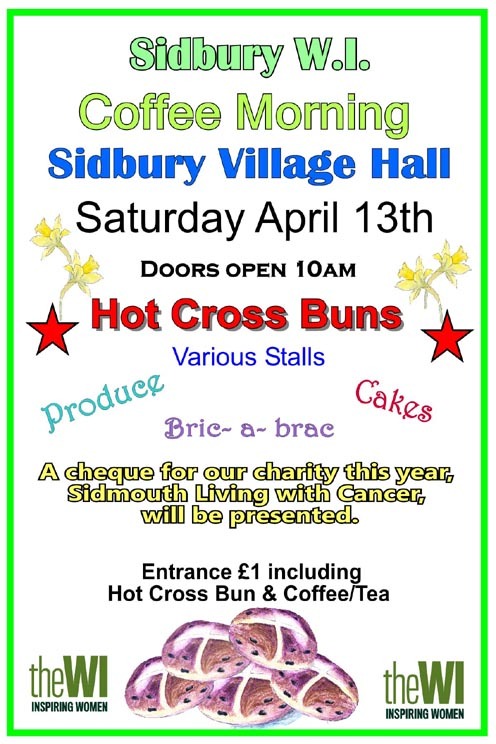 Entrance £1 to include Hot Cross Bun and coffee/tea. Wales and West Utilities will be working to replace 250 metres of old metal gas pipes in Fore Street Sidbury. Disruption to through and local traffic is inevitable! Visiting speaker - Penny Blower speaking on the subject of Colour Fashion and Fun. Guided tours start at 2.30pm - prior booking is essential. Visitors are shown around the main rooms of the Manor and then the gardens by a member of the family with extensive and personal knowledge of the the history and workings of this Grade II listed Victorian manor house set in attractive parkland. Tours are followed by a Devon cream tea in the house; visitors may then wish to have a further extended look at the gardens to round off the afternoon. Anton Webern - "Langsammer Satz"
Anton Dvorak - Op.18 "The American"
The SID AGM will be held in The Village Inn. 20 acres of garden including substantial walled gardens, an extensive arboretum containing many fine trees and shrubs, a number of champion trees, and areas devoted to magnolias, rhododendrons and camellias. Partial wheelchair access. Dogs on short leads welcome. African craft items for sale and all donations for The Gideon Anti Aids Foundation Uganda. A talk, display and discussion on Lyme disease. What it is, how to avoid it and what the issues are in UK diagnosis and treatment. Ticks: how to remove them properly & other diseases they carry. Risks to humans and domestic pets. Followed by a cup of tea. An afternoon of talks and strolls about the benefits of trees. Visiting speakers - Bill and Evelyn Lankester speaking on the subject of Living With Cancer Support Group. 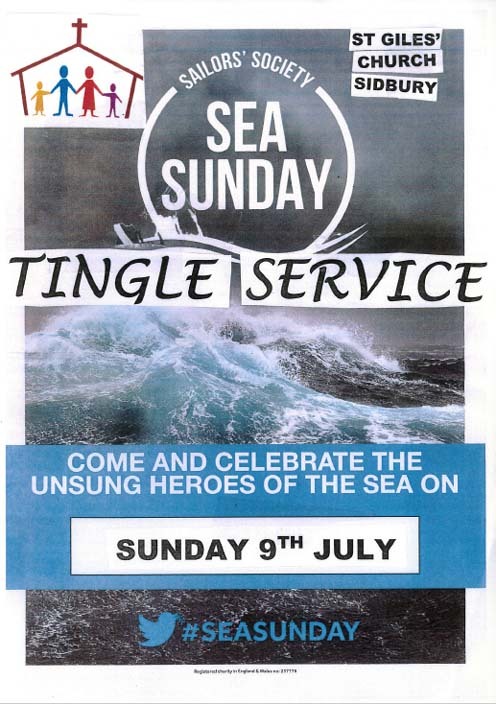 Monday 6th June from 4 pm. Dipna will be visiting the Red Lion Inn, Sidbury and serving up Punjabi dishes from the menu at the Brilliant Restaurant in Southall. Dipna will also be signing copies of her cookbook Beyond Brilliant. Dipna cannot wait to meet Devon and cook up a delicious curry feast for you all! BOOK YOUR TABLES NOW! LIMITED AVAILABILITY! 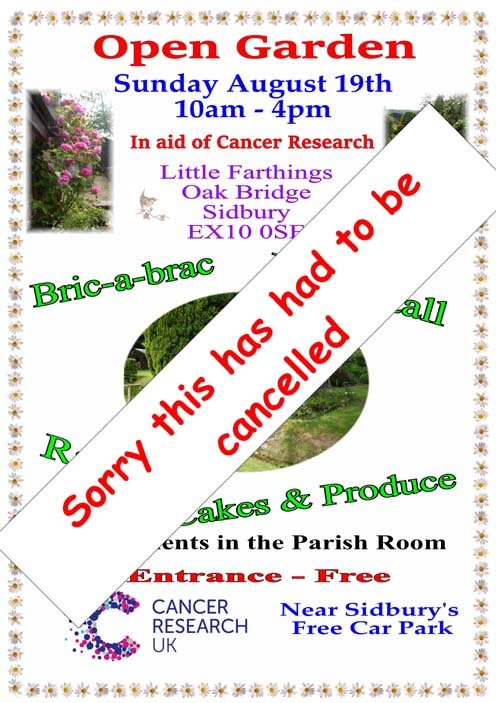 Do you wish to object to the proposed development at Sidford? I would be very grateful if you could raise the subject of the Sid Valley Neighbourhood Plan public consultation that is currently taking place, with your members and contacts to support us to ensure a good level of response. The initial Sid Valley Neighbourhood Plan questionnaire should be with everyone in the community by now, we are urging everyone to please take a few minutes to fill it out and then return to one of the collection points listed by the end of Monday 18th July. The views of the community matter and will be analysed and fed into what will become a statutory planning document once the plan is made. We know that members of the Sid Valley are passionate about the area and its future and want to see careful development that is needed. The Neighbourhood Plan Steering Group can only reflect the views of Sid Valley residents if they let us know what is important to them. Please help us to have a high response rate by investing a little of your time to return your questionnaire to us and by encouraging others in your networks to do the same by forwarding this email to them and by speaking directly with people to make sure they are aware of the Neighbourhood Plan project and its significance to the community. 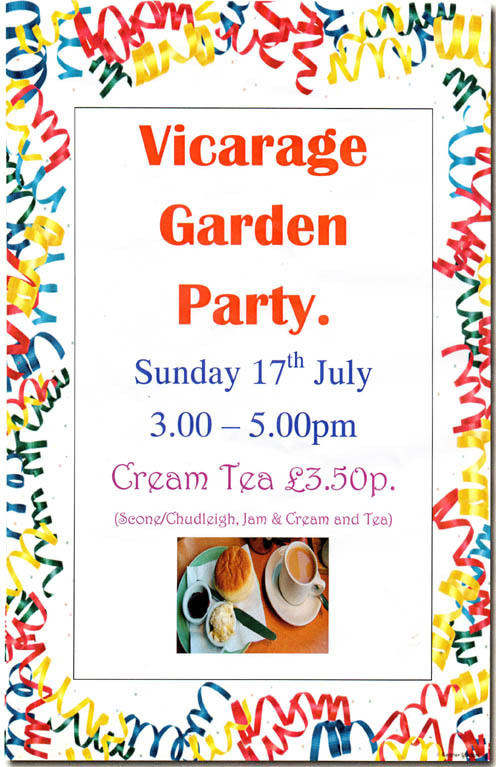 Peter and Ann Marchant are having a fundraising Cream Tea/Cakes in their garden at 5 Packhorse Close Sidford in aid of Hospicecare. Enjoy the Euro 16 Cup Final in comfort at The Village Inn. Mike and Tracey Coles welcome all their friends to join them to celebrate their wedding. £1 a go in the bar - get your tickets early! Come in on Sunday to see if you have been lucky! 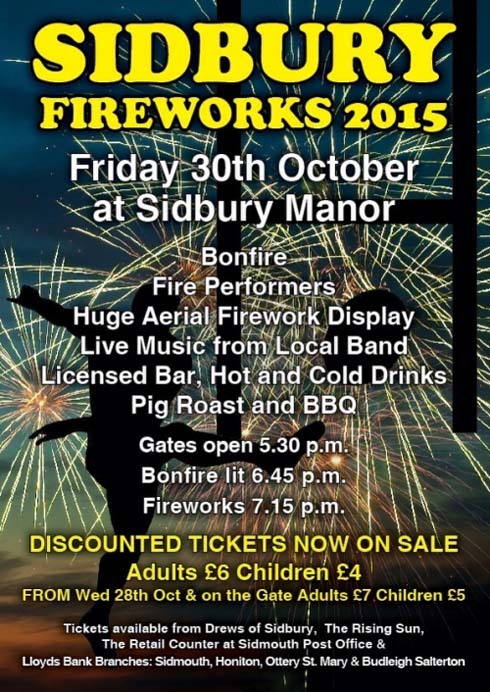 Show schedules available from the Village Inn, Red Lion, Rising Sun Sidford and Drews Butchers. 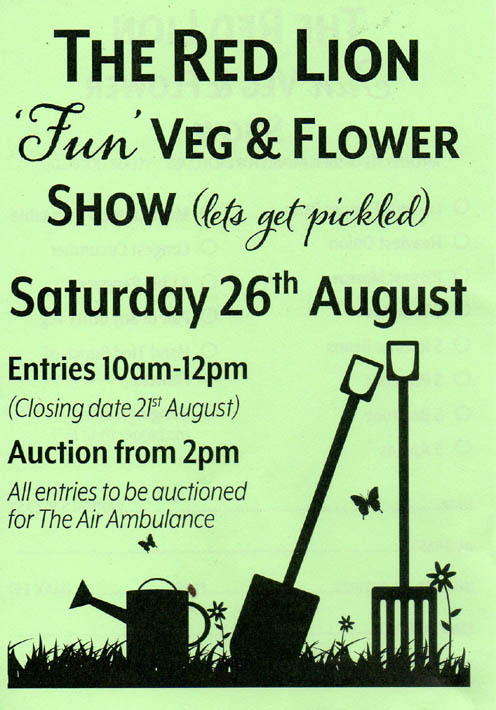 This year proceeds to Devon Air Ambulance and the Admiral Nurse Fund. 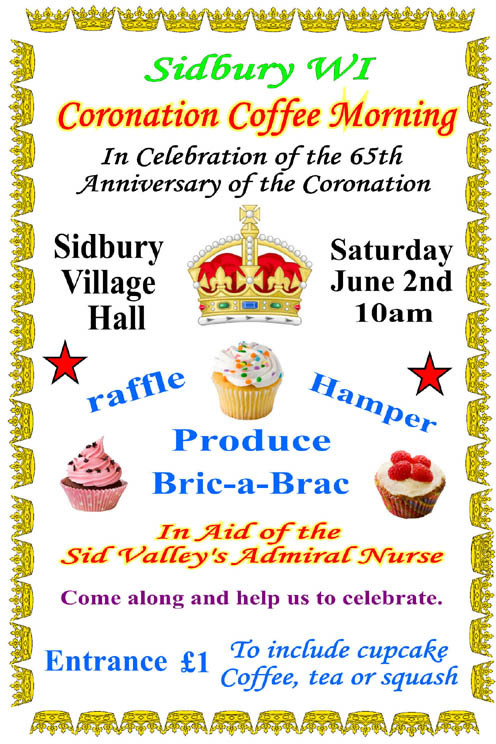 Everyone welcome, most of the produce is auctioned for charities. Please enter as much as you can and attend the auction it's a great day! 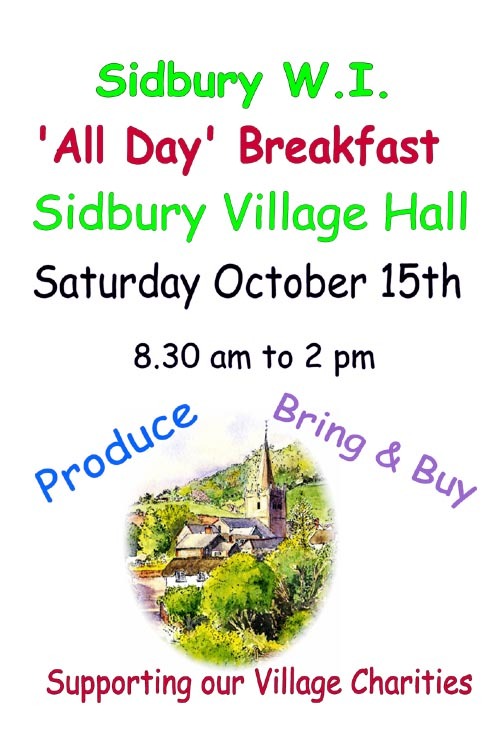 The Sid Valley Neighbourhood Plan questionnaire has shown that the Sid Valley's natural beauty is what residents like most and protection of it is what they are most interested in. Topping the list of concerns is traffic. 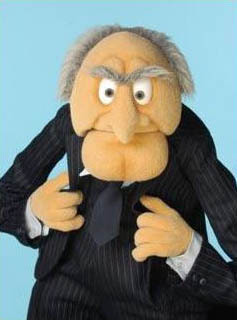 The Sidmouth Herald reports that just 42 people in Sidmouth are claiming job seekers allowance. We do not need a large new site for employment land. It would increase the already heavy traffic on unsuitable roads and it has the potential to increase the flooding risk. As East Devon District Council has received amendments to the original proposal it is consulting again. The new documents are dated 19 August. The closing date for response is 16 September 2016. 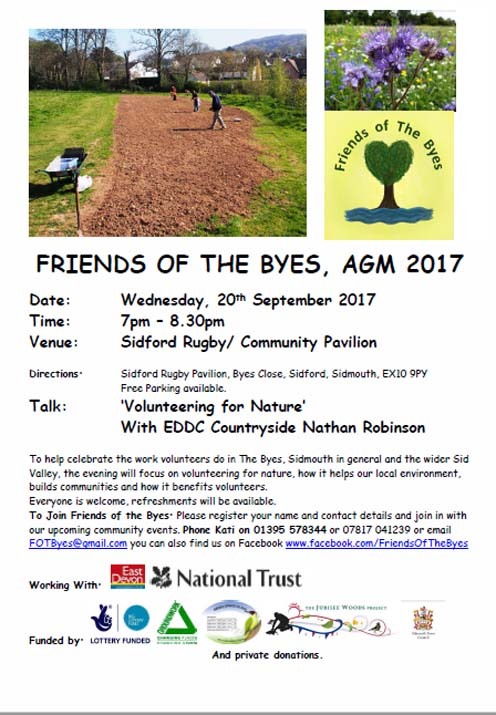 Come to the Public meeting at Sidford Social Hall on Monday 12th September 2016 to find out more. 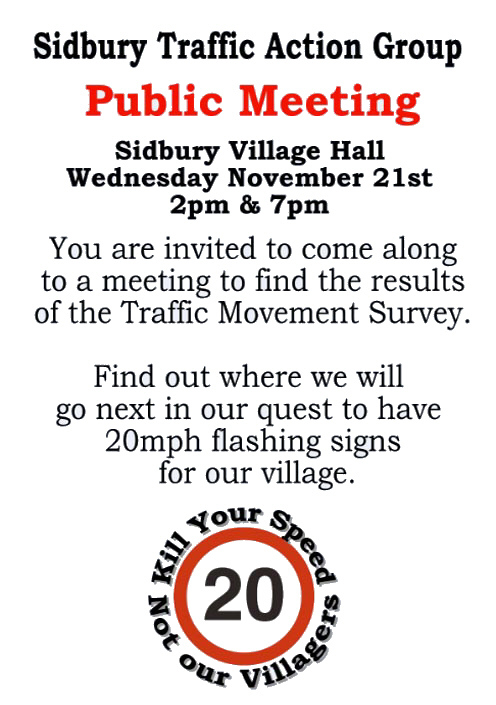 This meeting has been organised by residents of Sidbury and Sidford who are concerned about the impact of the site. Ducks on sale all day! To include tea and cake. 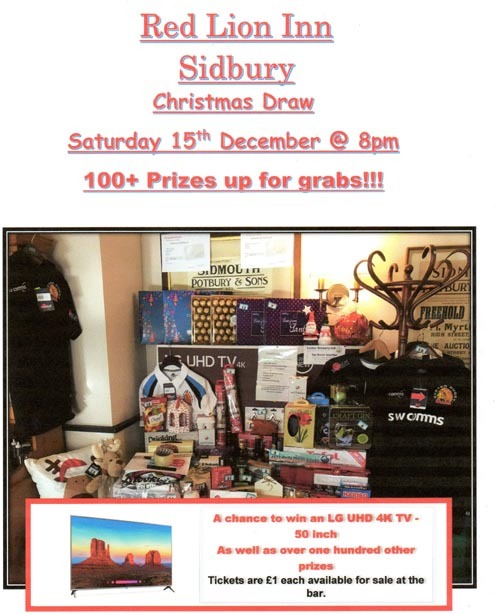 Get your tickets for The Red Lion Christmas draw ... to be drawn on Saturday 17th December 2016. Many prizes already disclosed more to be added in the coming weeks!!!! For a fun night out. With a special bingo caller all the way from the USA. Eyes down at 8.00 pm. A short service in the churchyard for the laying of crosses with the children of Sidbury Primary School. 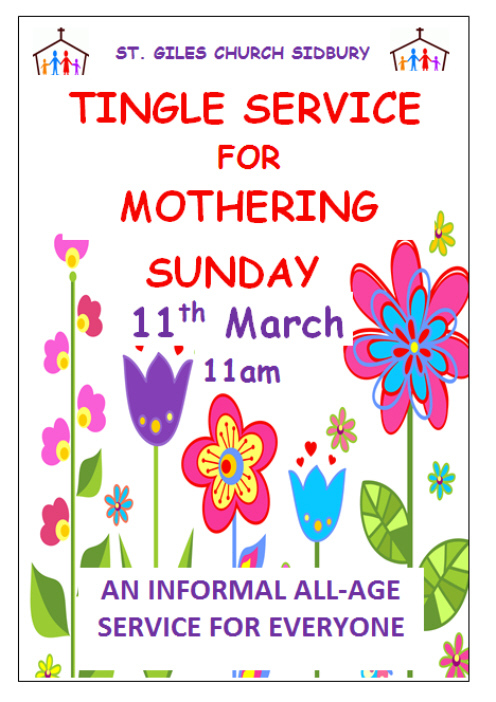 Admission £1.50 to include a cup ot tea and a cake. 7.30 pm for an 8 pm start. A little flutter on your fancied gee-gees! 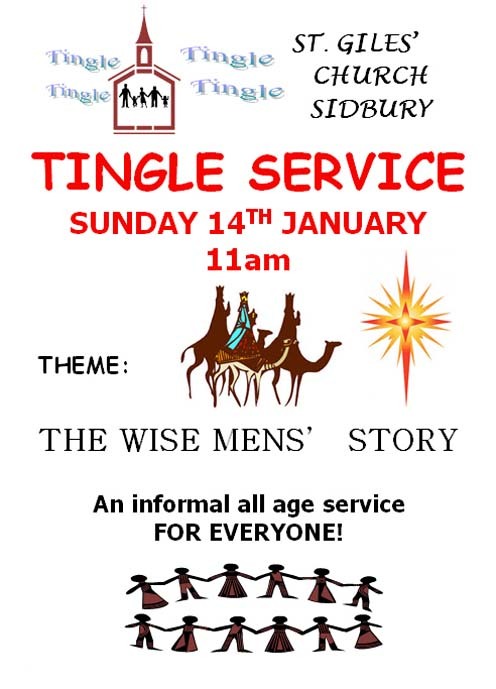 The theme will be 'The Wise Men's Story' . Guest speaker - Geordon Partridge, "22 Years as a Lighthouse Keeper". 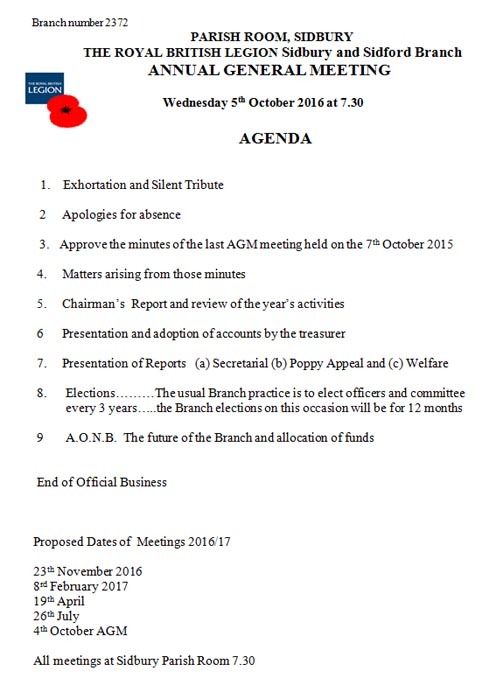 The AGM this year will be held in the Skittle Alley in the Red Lion on March 29th at 7.30pm. 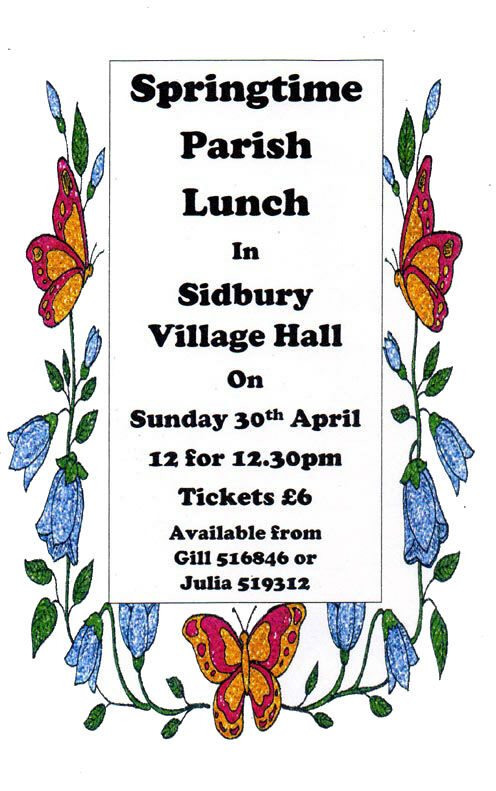 Guest speaker - Mr. Adrian Harvey, "Sidmouth Town Band". The gardens will be open for the NGS (National Gardens Scheme). 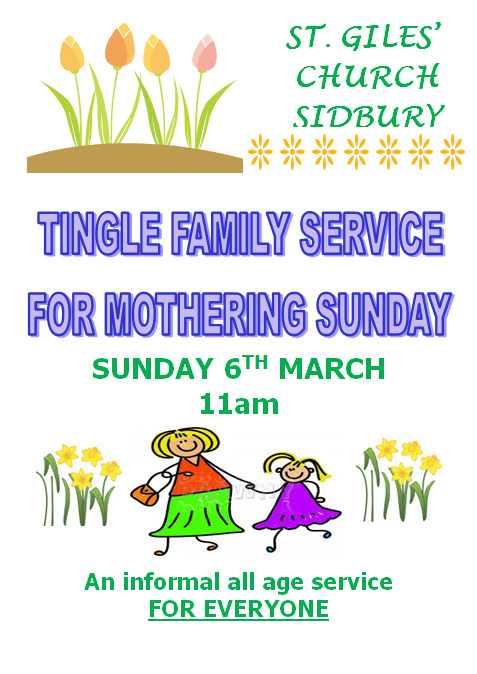 Admission £5.00, children free. Home-made teas. All main ground floor rooms plus 'a look behind the scenes' which includes ascending/descending two sets of stairs; followed by a short guided tour around the gardens. After tea visitors may wish to further explore the gardens. See www.invitationtoview.co.uk for further details and booking. You are invited to a three course dinner with plenty of time to muse over "Who Dun it". Tables will be for 8 people with wine for sale on the night. 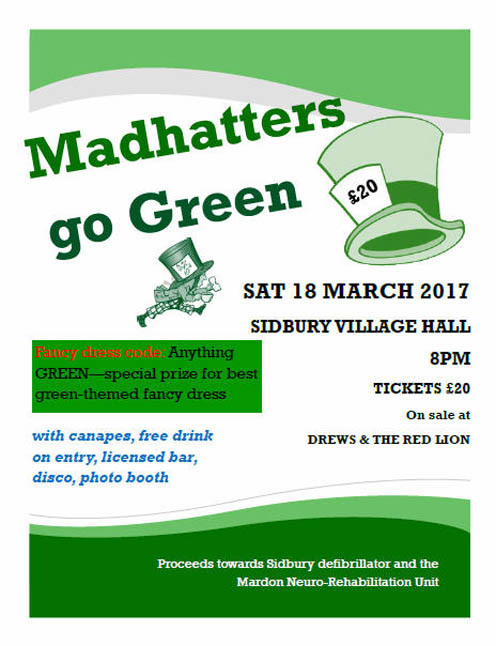 The cost of the tickets will be £10.00 (not inclusive of the wine) and the dastardly deed will happen in the Village Hall between 7pm and 10.30pm on Saturday 29th April 2017. Tickets from Drews from the 1st April 2017. More details to follow re dress code! 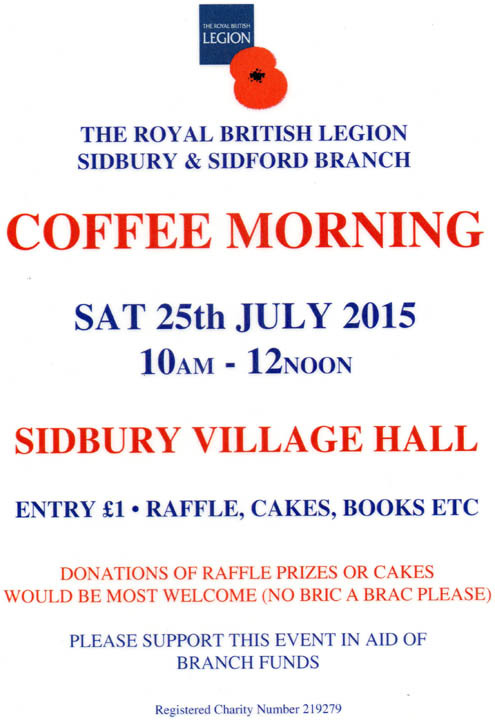 Cakes, Presents, Books, Raffle etc. 7.30 pm for an 8.00 pm start. 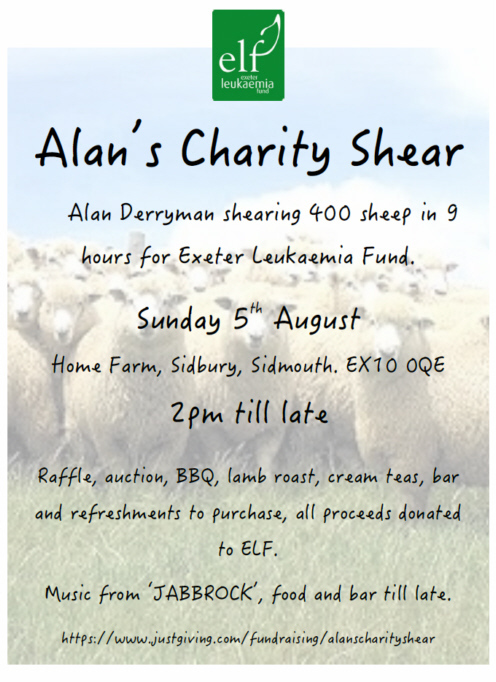 All proceeds go to the Devon Air Ambulance. Book in a team of 4 (max)and join us for an (always) enjoyable evening. 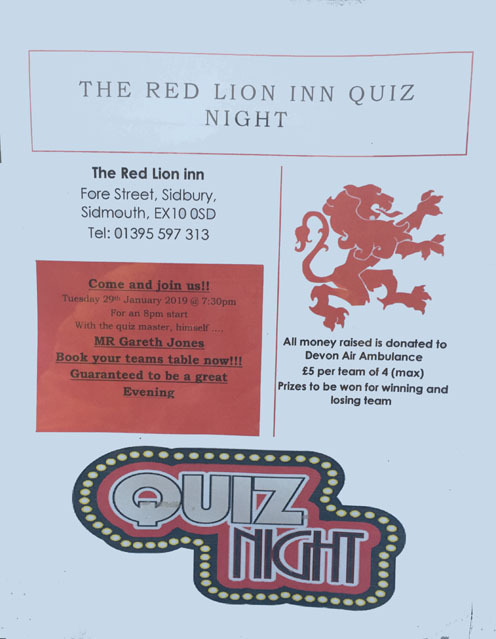 Call 01395 597313 to book your team in. You are invited to the Red Lion Inn One Year Anniversary. All welcome to join us in celebrating our first wonderful year at the pub. We look forward to enjoying the day with all of you that have supported us and made this year so special!!! Guest speaker - Mr Matthew Button, "Epic Journey 40 Years On". Sidbury Millennium Green Trust AGM and site visit will be held on Thursday 22nd June at 1.30pm on the Millennium Green at Deepway Meadow, followed by a short tour. Guest speaker - Dr. Peter Marsden, "Cesspits, Cemeteries and Sewers - Life as an Archaeologist". 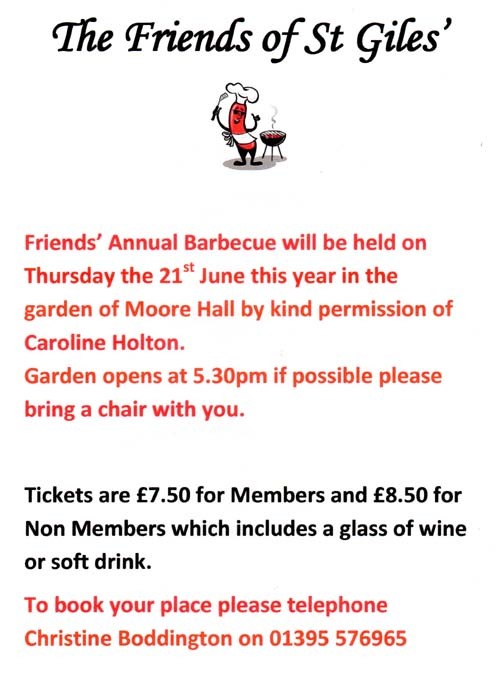 To be held in the garden of Moor Hall by kind permission of Geoffrey and Caroline Holton. Ticket price includes a glass of wine or a soft drink. Guest speakers - Nicola Colbourne & Bridget Spooner, "The role of an infection, prevention and control nurse". Scarecrows to gather at Parish Rooms on Sat morning. 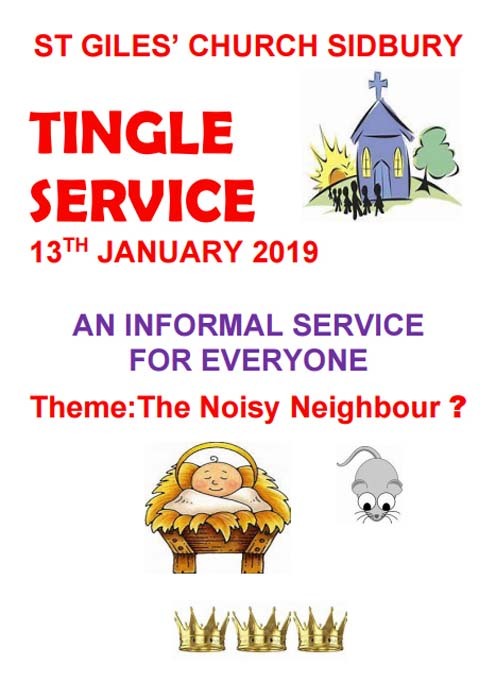 Ridgeway will be closed to traffic at 10.45am until 12.45pm so cars parked in the village car park, in Badger Close or David's Close will not be able to leave - except in an emergency. 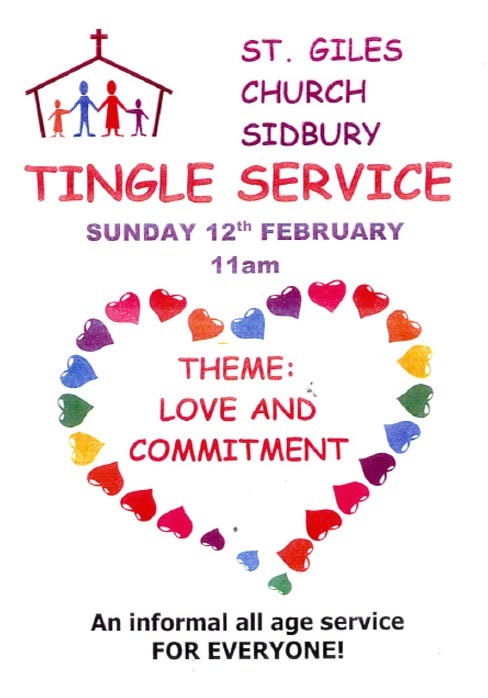 PLEASE can participants park on the Millennium Green or in Hallett's Field which is over the bridge behind the church. Hot (warm!) pennies collected in Drews’ butchers shop and the Red Lion are thrown over the churchyard wall for Sidbury school children to collect. Guns, cartridges and safety equipment supplied. Jordan Cross Memorial Duck Race 3.30pm Cash prizes! 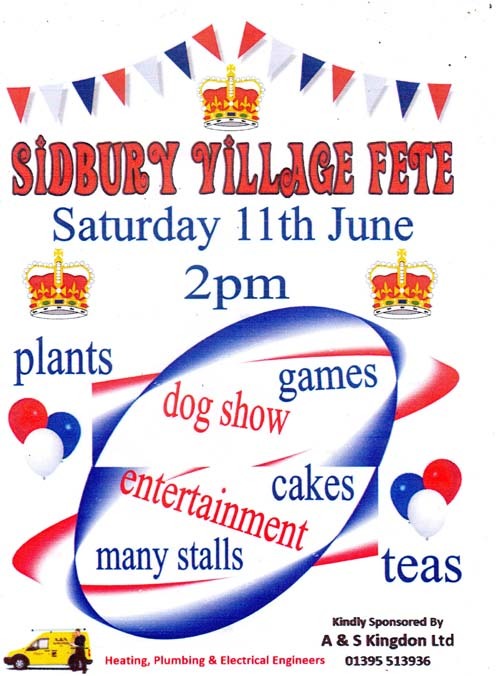 Ducks jump into the River Sid in Sidbury school grounds and head to the Millennium Green where there will be a BBQ and children’s activities. Money raised goes to the school. 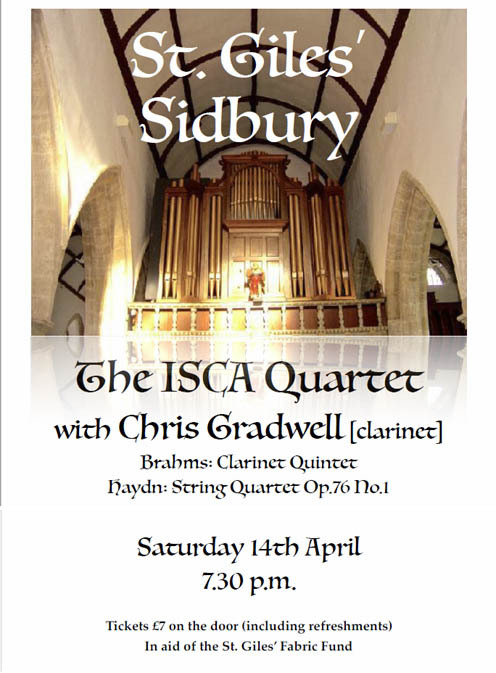 A fun evening for beginners and experienced players alike! Prizes to be won for winning and losing teams!!! 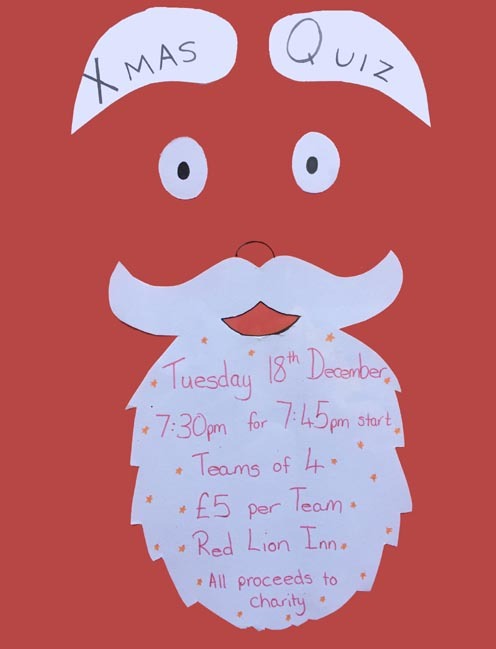 £5 for a team of 4 (max)and join us for an (always) enjoyable evening. Guest speakers - Colin Humphrey, "Winter Birds". 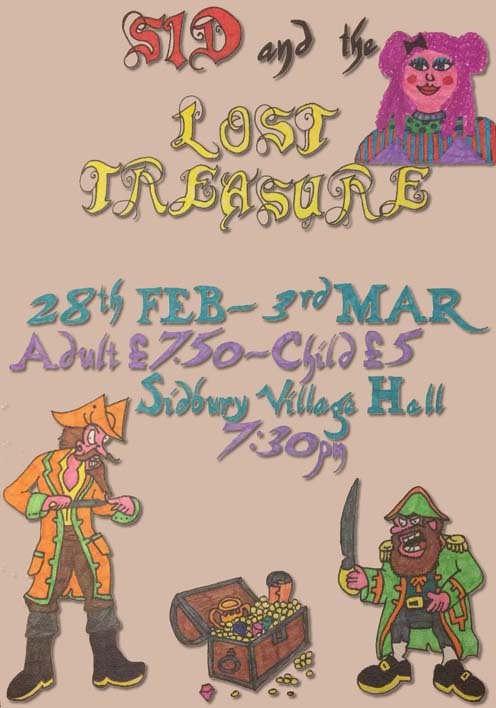 SID Panto for 2018 "Sid And The Lost Treasure". Please if you would like to take this opportunity be there for 7pm ready to start promptly. 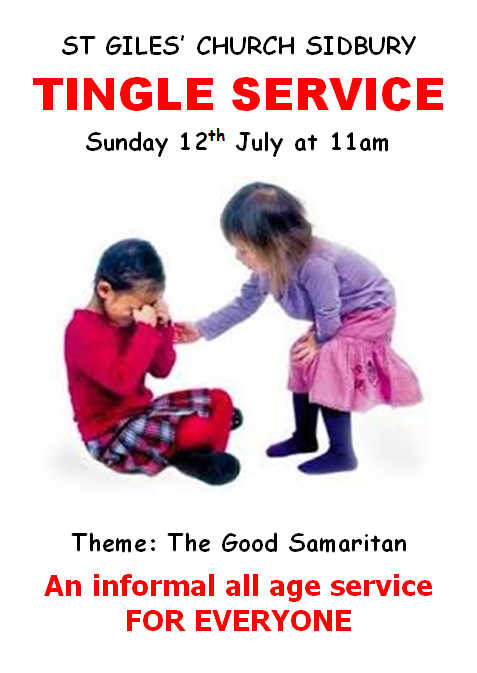 Anyone just wishing to help please come along too. Remember, remember the 9th of November! 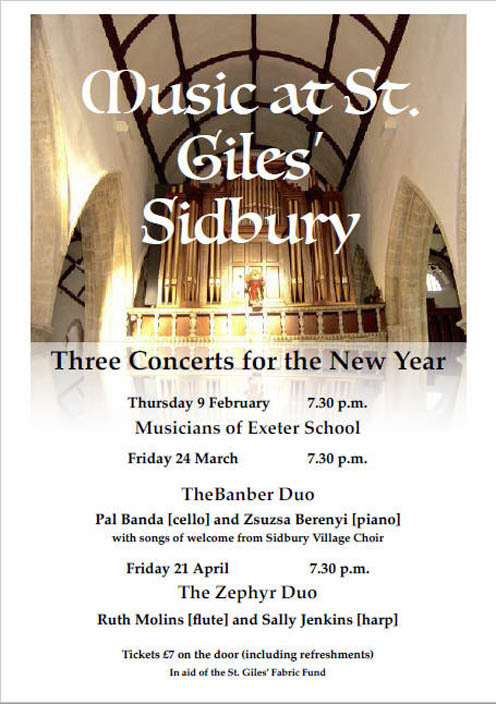 Come to a special concert at St. Giles Church. "Our Choir" singing words and music with Lynden conducting, Ashlynn on the flute and Robert "The Word" Smith. 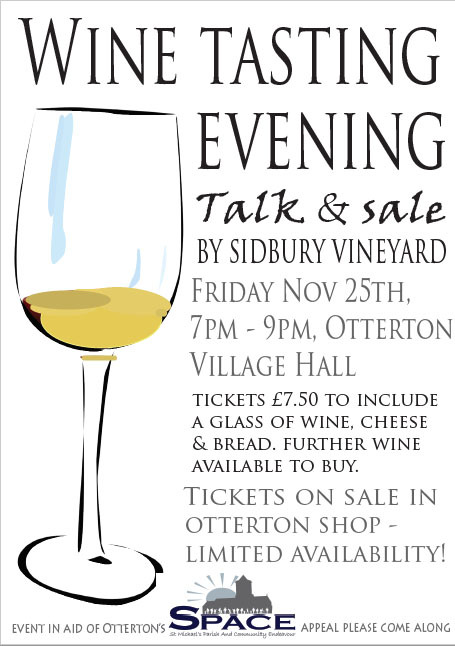 Tickets £5 on the door to include a glass of wine and delicious nibbles. 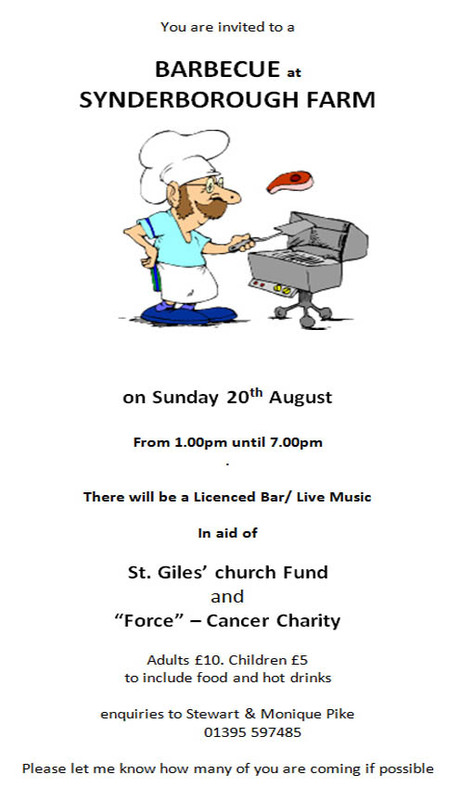 All proceeds to St Giles Church Fund. 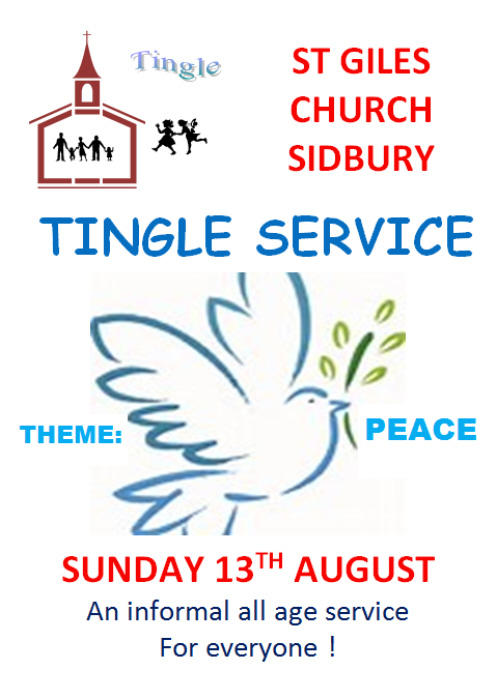 Short Service in the Churchyard at 10.45 pm for the laying of crosses with the children of Sidbury Primary School. 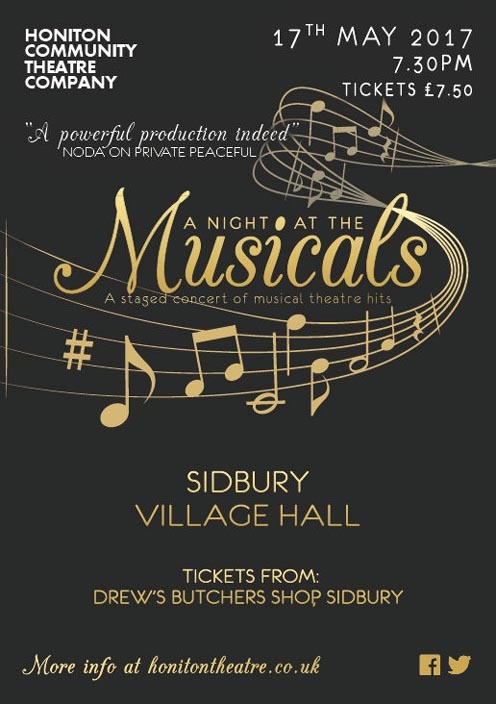 Sidbury Into Drama will present two one-act plays with a buffet supper during the interval on three consecutive nights November 30th - December 2nd. 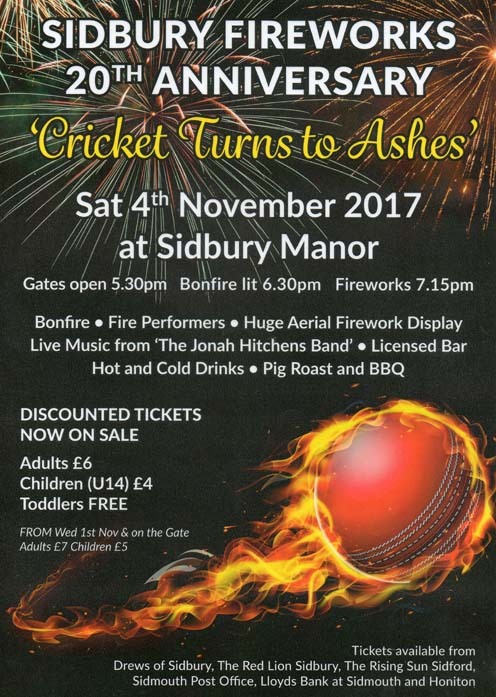 Tickets available from Drew's butchers NOW! 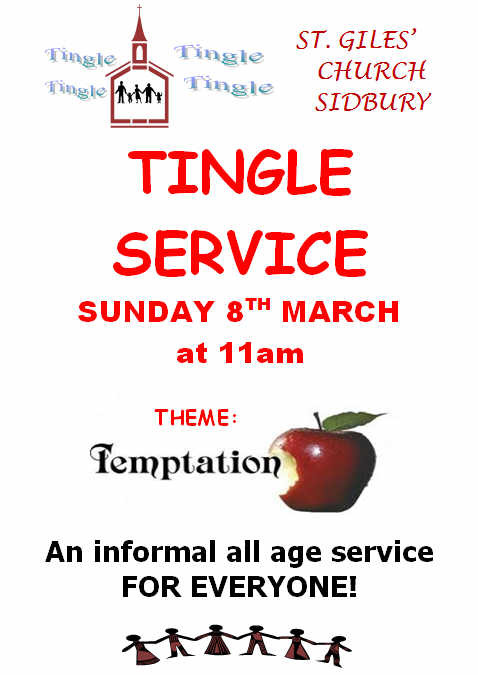 Adults £10 - Children £7.50 to include buffet. Please note that Drew's cannot reserve tickets nor take bookings over the phone. Tickets sold only over the counter. 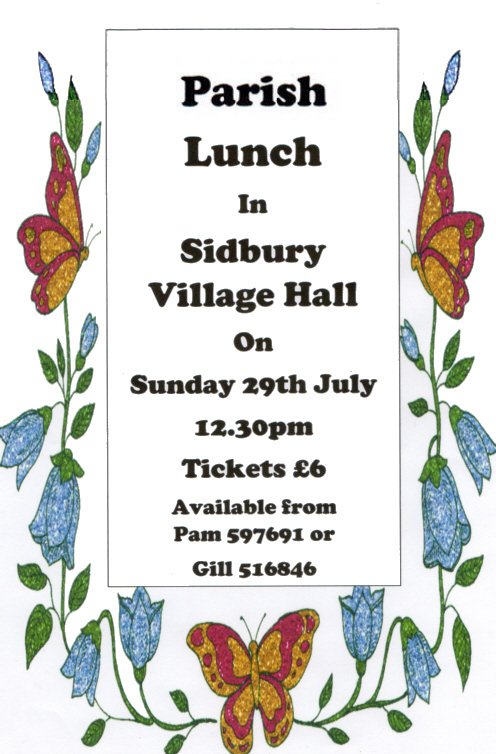 Sidbury Into Drama will present two one-act plays with a buffet supper during the interval. Guest speakers - Alex Graeme, "The story behind the Hound of the Baskervilles". 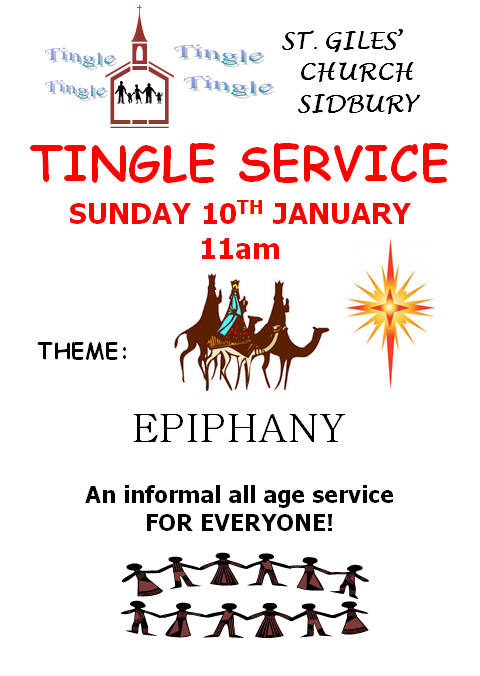 Join in with all your favourite carols. Mulled wine and mince pies to warm you up! To be drawn from 8 pm onwards. Bar snacks available only from 6 pm to 8 pm. 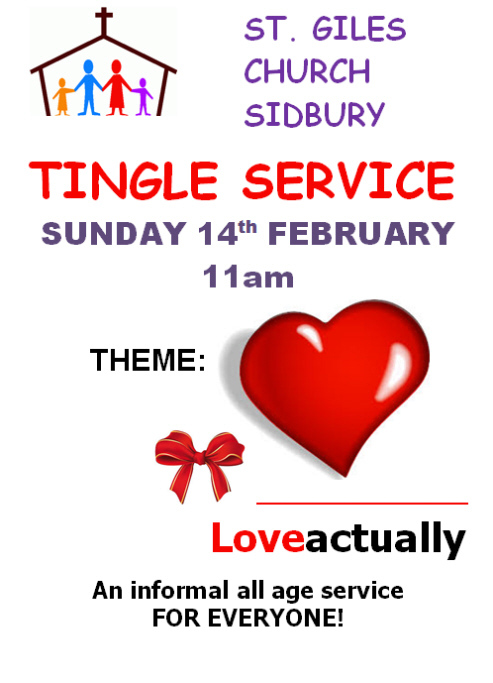 Book teams and tables in advance to avoid disappointment! 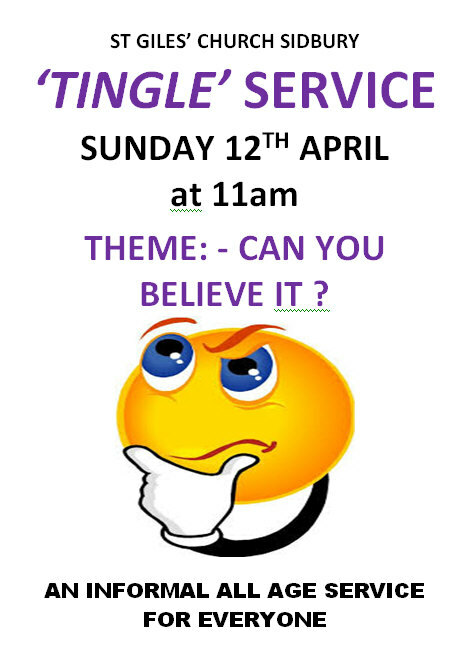 Organised by our very own funny man Mr Paul White but always hosted by a Famous Celebrity!!! Guaranteed to be a Santa's sack full of fun!!! Dress code - your best, and most comfortable PJs. From 7.00 pm till late. Guest speaker - Tony Burges, "The City of Exeter". Guest speaker - John Scott, "Beer Quarry Caves". PLEASE NOTE - although Drews have kindly agreed to sell our pantomime tickets, they are NOT a booking agency! 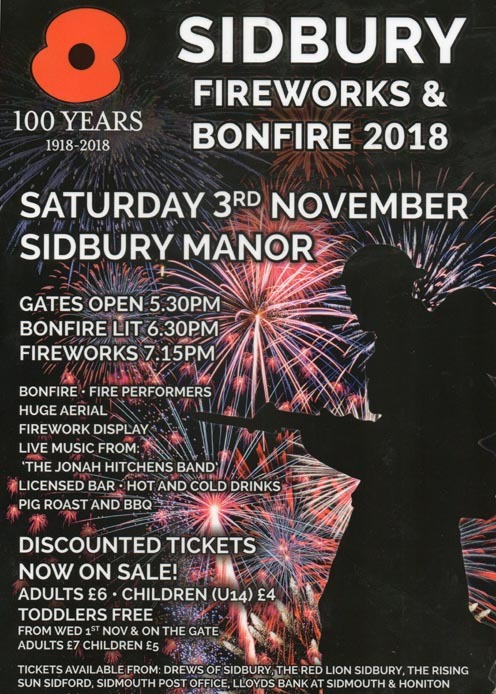 Tickets CANNOT BE RESERVED by telephone for any night and can only be bought over the counter on a first-come, first-served basis. No card payments can be accepted - only cash or cheque. The decision has been taken to cancel tonight's performance due to existing weather conditions and the Met. Office "Red" warning. 24 seats for Friday, 61 seats for Saturday. 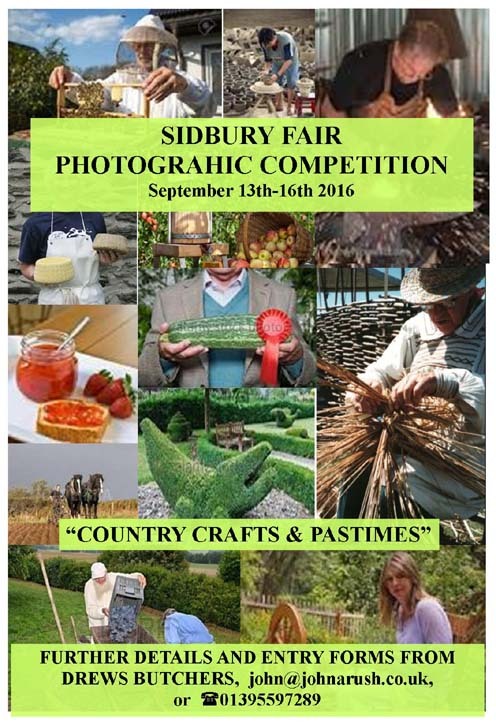 Alternatively you can consult the website, www.sidburysids.co.uk for refund procedure. SID PANTO 2018 ALL PERFORMANCES RE-SCHEDULED! Important notice - due to the adverse weather conditions we have had to cancel ALL remaining performances of the panto. 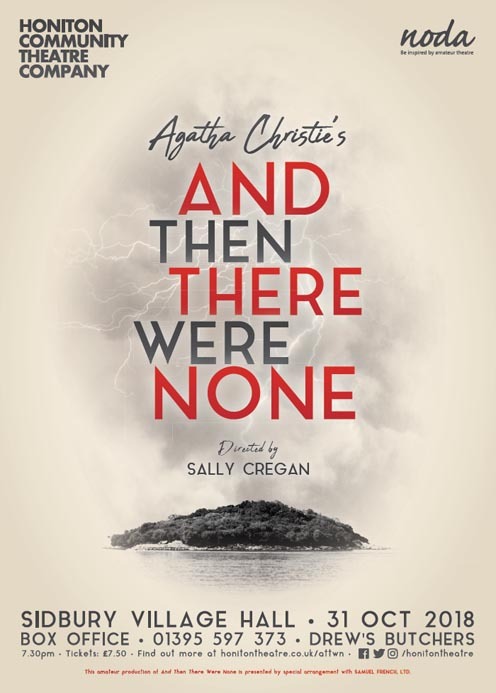 The good news is that Thursday, Friday and Saturday tickets will be valid for performances NEXT WEEK from Thursday March 8th to Saturday March 10th. Tickets for the original Thursday, Friday and Saturday performances will be valid for the same night in the following week. 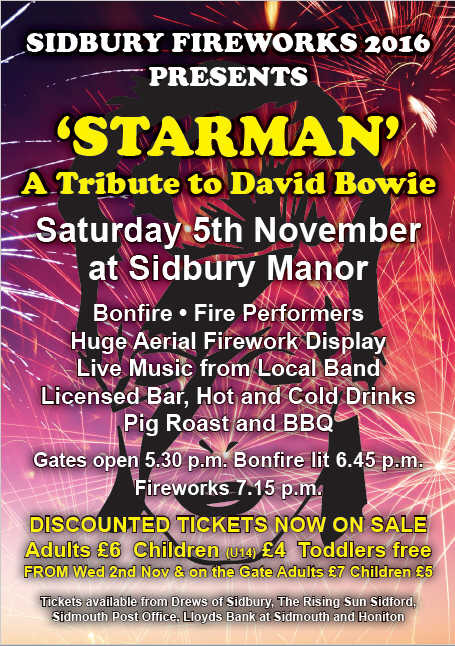 Tickets are no longer available from Drews Butchers - a small number will still be available on the door. Contrary to the previous statement tickets ARE STILL available from Drews Butchers. Guest speaker - Jackie Juno, Stand-Up Poet, "65th Birthday Party". Due to the adverse weather conditions we have had to cancel ALL remaining performances of the panto. All tickets for the Thursday March 1st performance will be valid for the Thursday March 8th performance..
All tickets for the Friday March 2nd performance will be valid for the Friday March 9th performance. All tickets for the Saturday March 3rd performance will be valid for the Saturday March 10th performance. 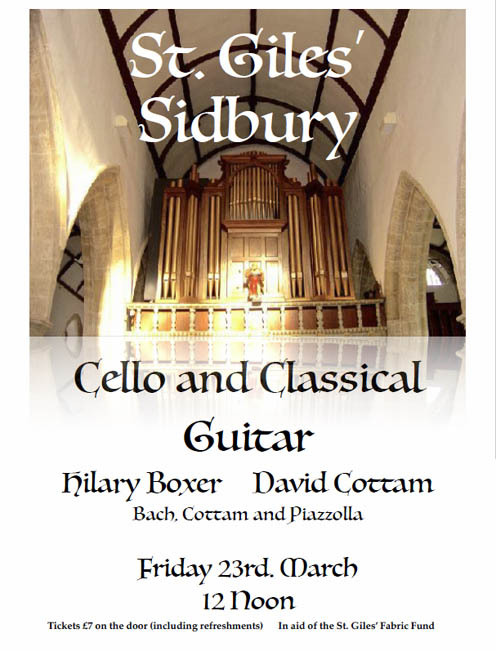 Hilary Boxer [cello] and David Cottam [classical guitar] play Bach, Cottam and Piazolla, followed by soup and sandwiches. To be drawn during our Easter Bingo, Saturday March 31st. 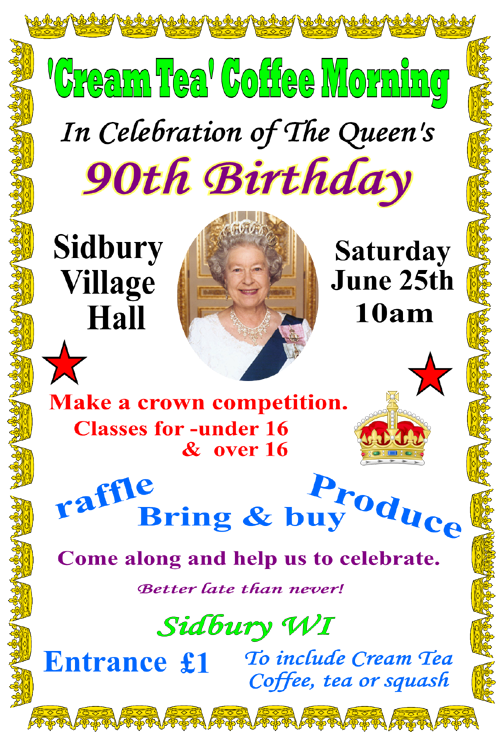 Please purchase tickets at the bar - £1 per ticket. We wish you luck and hope to see you on the night! Guest speaker - Anne Pagliero, "The History Of Faberge Eggs". "Kill your speed - not our villagers!" campaign. Sidbury Flower Arrangers Demonstration of flower arrangements for the church follwed by a Workshop. The garden was started in 1947 and has been developed ever since. Trees and shrubs are well established - some of them rare and unusual. The garden has never been professionally designed. It has grown and changed to suit the owners' tastes. 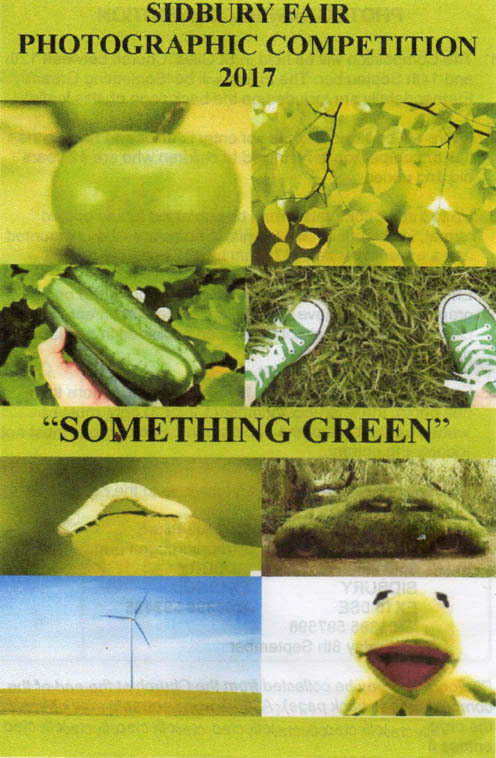 It aims to provide colour and interest all the year. 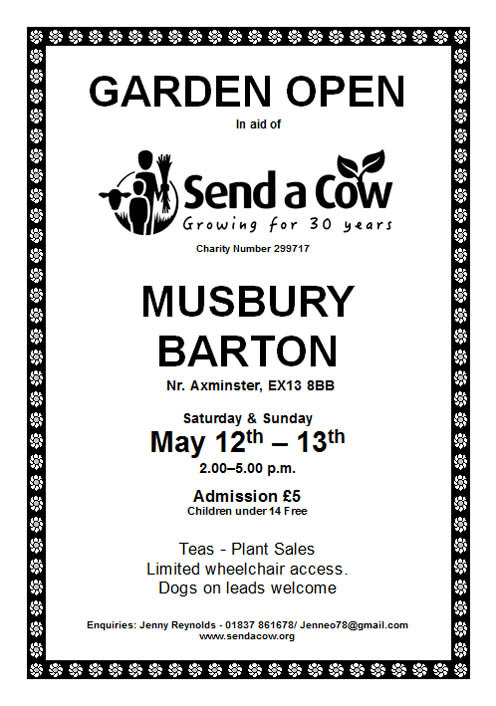 There will be Teas on the Terrace and plants for sale. This is a glorious, five acre garden in a wooded valley complete with stream. Due to its steep paths and steps, wheelchair access is limited to the terrace from which there are fine views of much of the garden. 3m S of Axminster off A358. Turn E into village, follow yellow arrows. Garden next to church, parking for 12 cars, otherwise park on road in village. Entry £5 - under 14s Free. Come and join us for a CREAM TEA in Sidbury Parish Room on Tuesday 15th May. 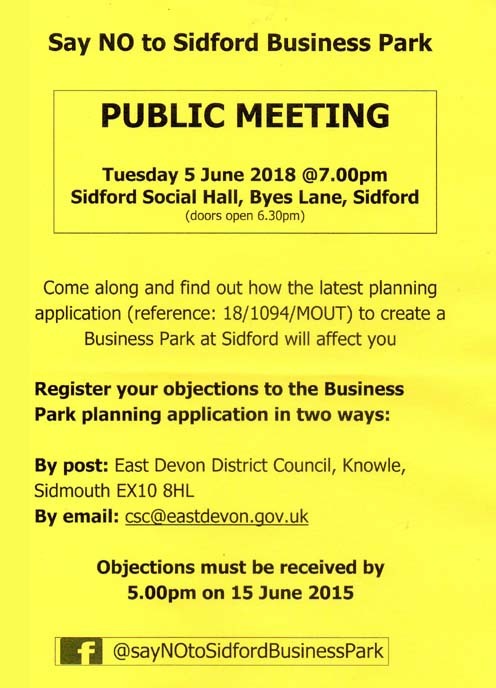 The council is holding a public planning meeting on Wednesday 30 May 2018 at 6.30pm at Sidford Social Hall in Byes Lane. 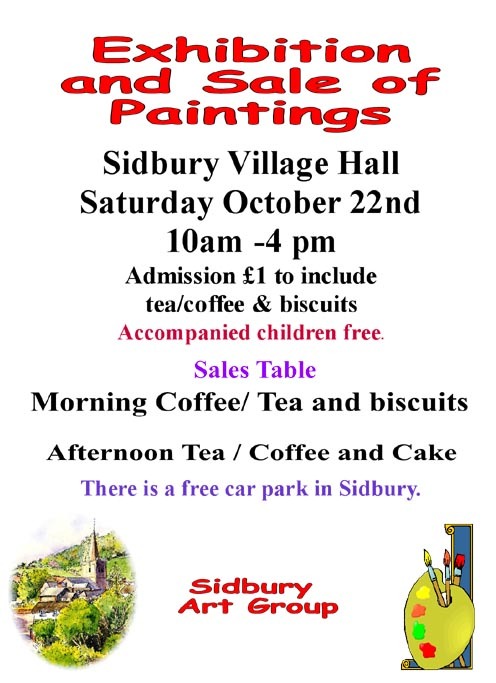 Please come along and have your say about how this will impact upon Sidbury. And please tell your friends about it. Guest speaker - Will McNally, "Muffin The Mule And Friends". Come and join us for the England v Panama World Cup game. 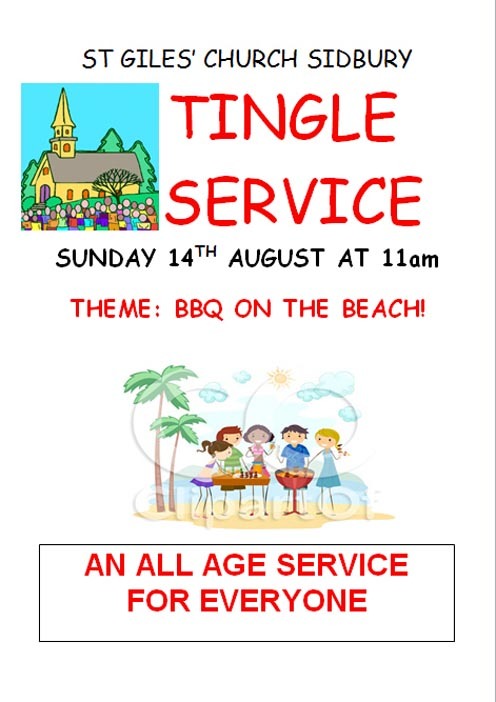 BBQ 1 - 4 pm. £5ph Eat as much as you like!!! 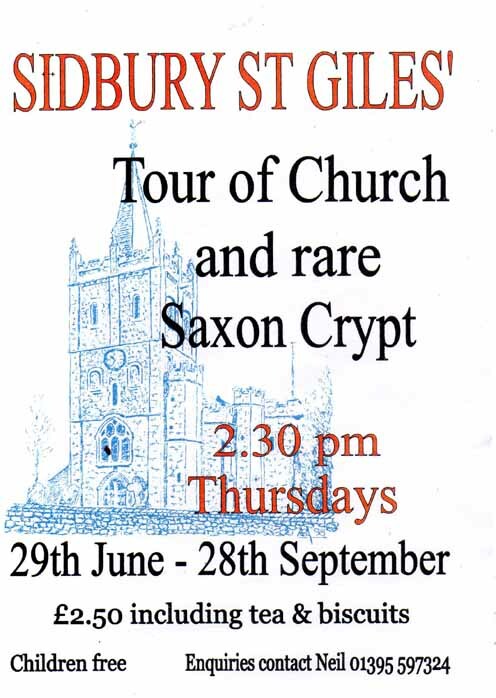 Why not join us for a fascinating tour of this famous old church with its rare Saxon crypt. Starting on 28 June and running every Thursday afternoon until 27 September and starting at 2.30pm, the hour-long expert guided tour will reveal the intriguing features of the outside of the church as well as the rare examples of medieval wall paintings within. 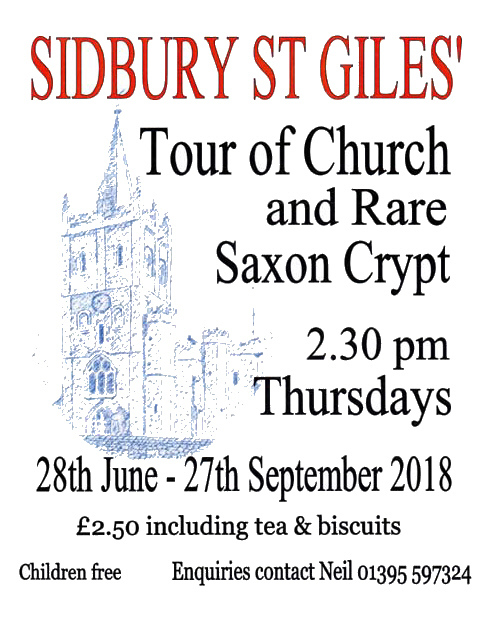 The tour finishes with a unique chance to visit one of only six Saxon crypts in the whole country. 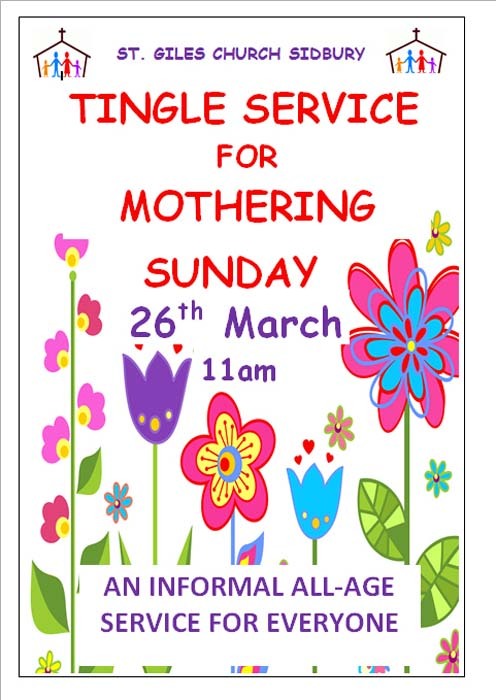 Tea and biscuits provided and all for the princely sum of just £2.50 with children free. 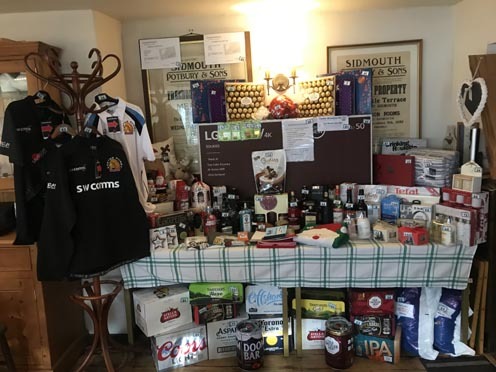 All entries to be auctioned for the Air Ambulance. Scarecrows to gather at Parish Rooms on Saturday morning. They will then be helped to find a comfortable spot in the village to spend the week scaring everyone passing by! The more entries the scarier the village will be! Hot (warm!) pennies collected in Drews’ & The Red Lion are thrown over the churchyard wall for Sidbury Schoolchildren to collect! 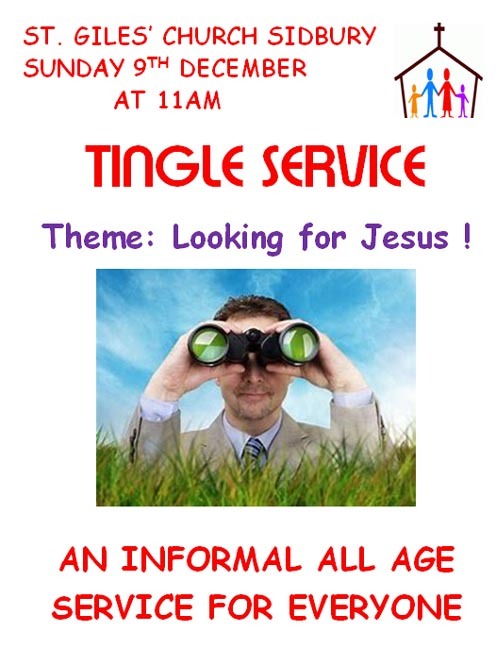 Open to all children in the Parish. In St. Giles' Church. Theme: ‘TREES’. It's always great to see the church full of photos during Fair week – so go on, make this year’s display the biggest ever! 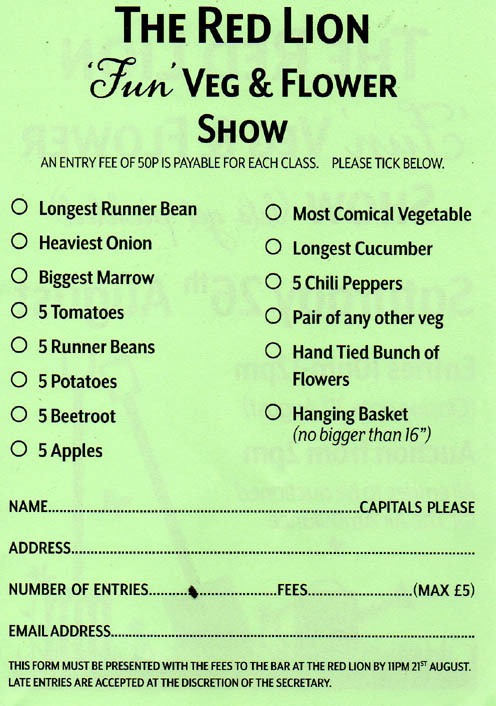 Entry Forms at Drews Butchers or email gooding428@btinternet.com for a copy. 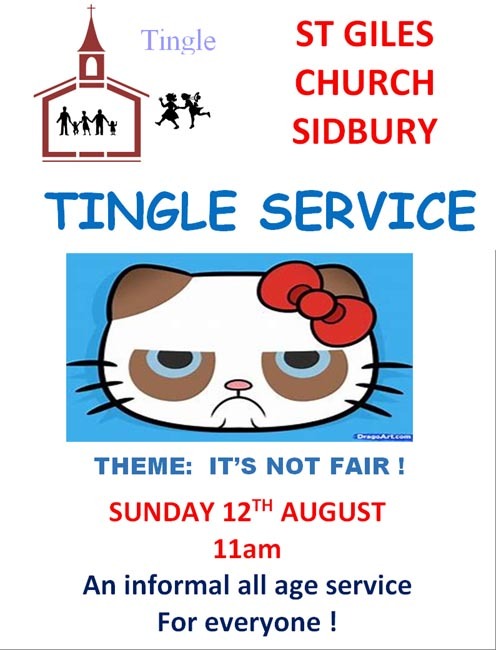 The topic for the Archive exhibition taking place in the church on Fair day (12 September) and the three days following is Sidbury in the 1950s. If anyone has any information or photographs they would like to contribute Neil would love to hear from you. You can contact him on 01395597324. 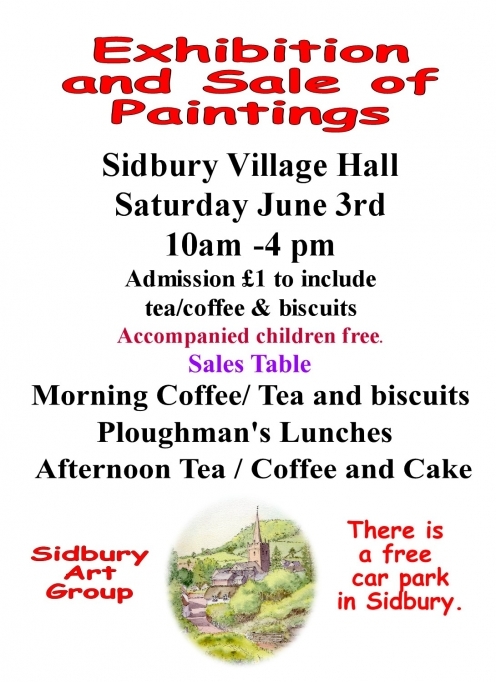 Displays of art from Sidbury Art Society. 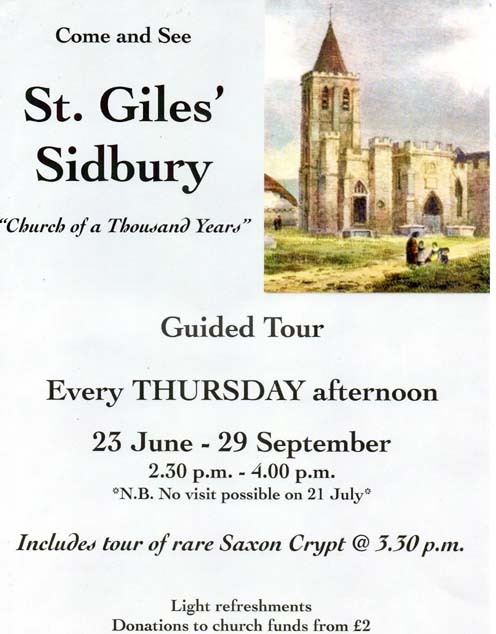 Photography and history in St Giles' church with archive photograph exhibition of Sidbury in the 1950s. 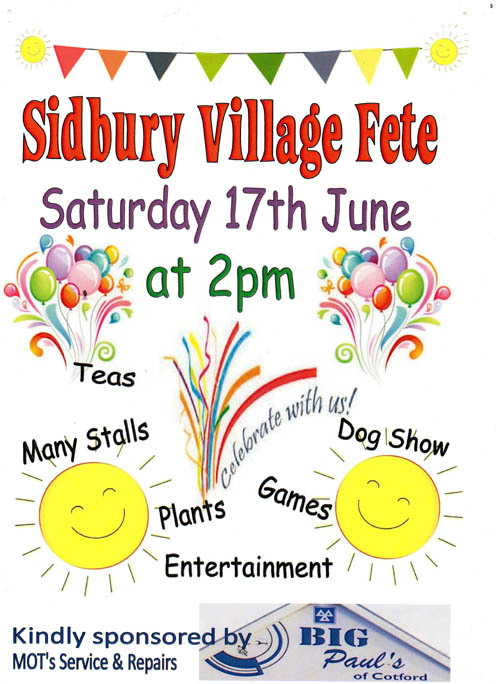 Ducks jump into the River Sid in Sidbury school grounds and head to the Millennium Green where there will be a BBQ and children's activities. Presentation by 'Farms for City Children' representative. 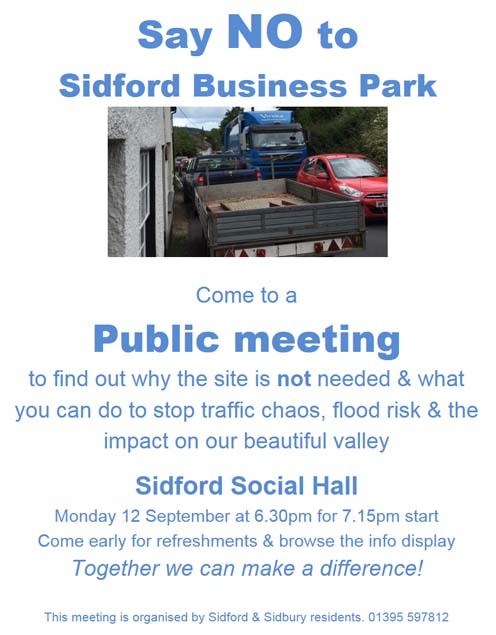 A quick reminder of the Public Meeting that the Say NO to Sidford Business Park Campaign has organised for this coming Wednesday (10 October) evening. 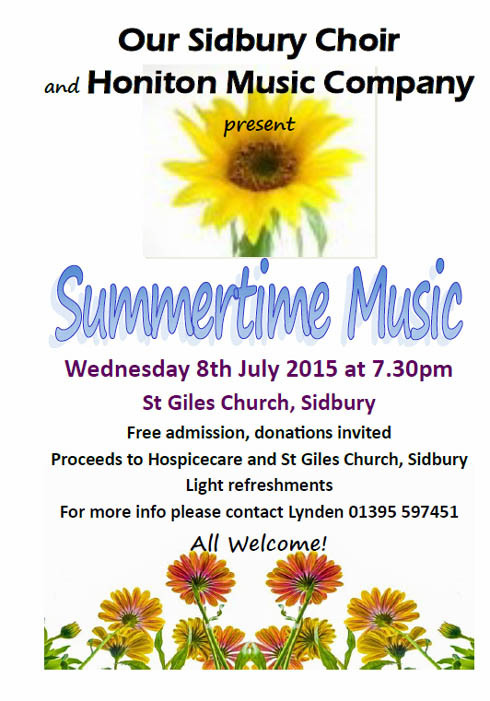 It starts at 7.00 pm and is being held in St Peter's Church Hall in Sidford. Please come along to the meeting on Wednesday evening. Your support and involvement in making sure that the Business Park isn't built remains important. 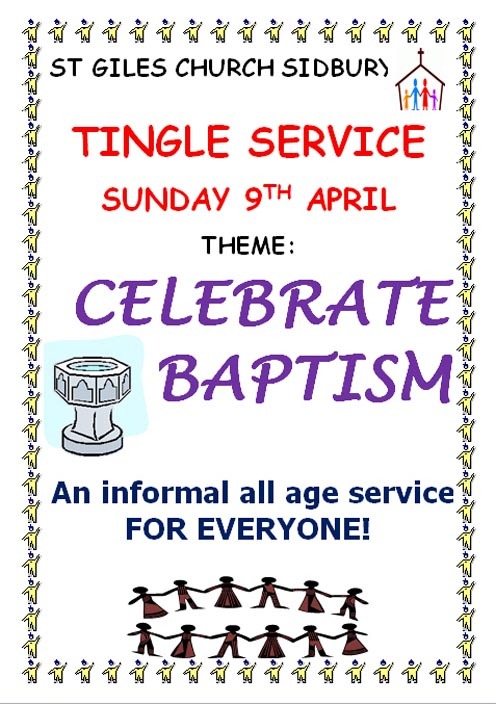 Don't forget to encourage your friends and family to come along as well! 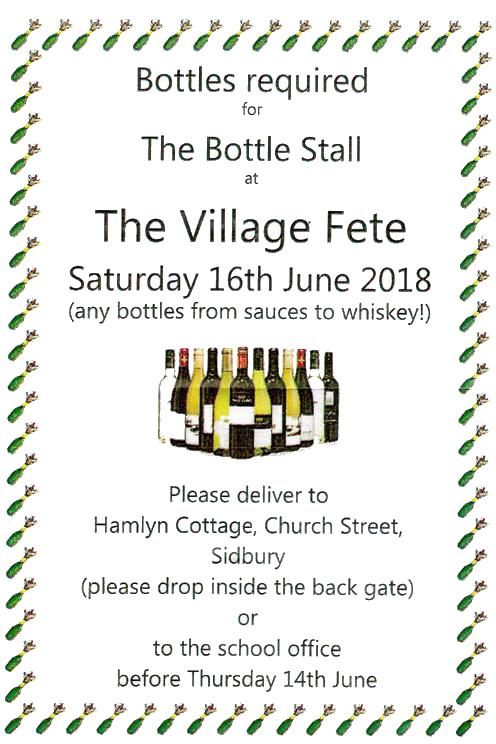 If you are coming from the Sidbury direction to the meeting please be aware of the roadworks that (ironically) are taking place in the evening literally outside the field where it is proposed to build the Business Park. 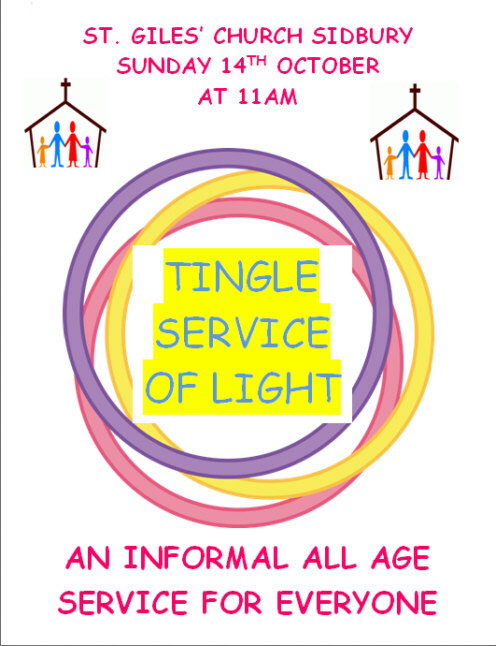 Not essential, but if you are coming can you please wear light colours. 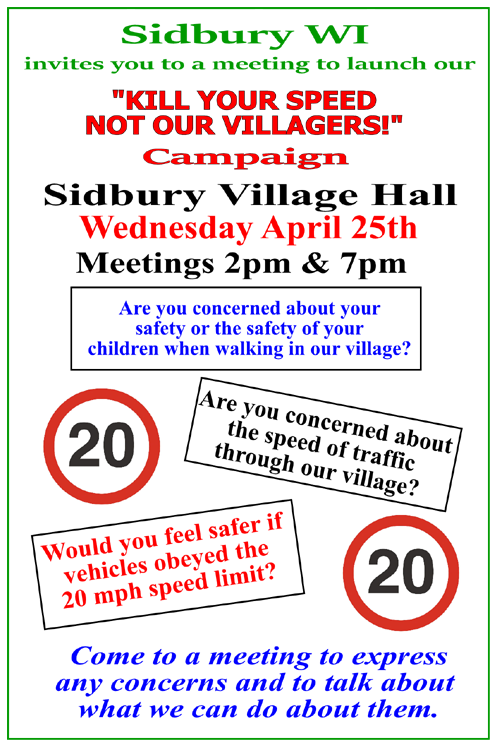 A public meeting to advise of the progress and future plans of the "Kill your speed - not our villagers!" campaign. 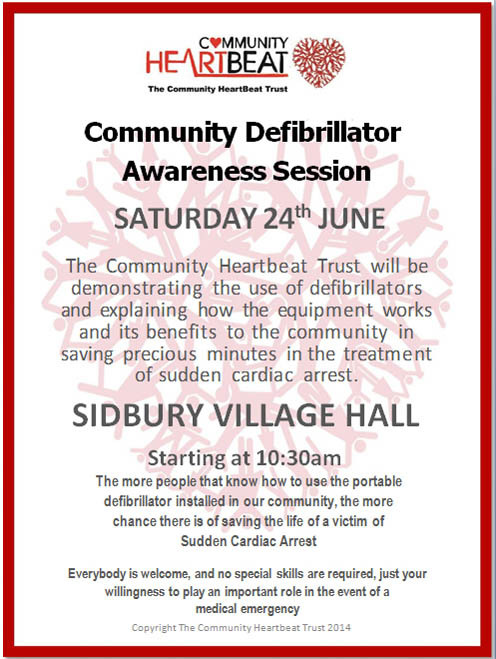 Sidbury Village Hall at 2.00pm. 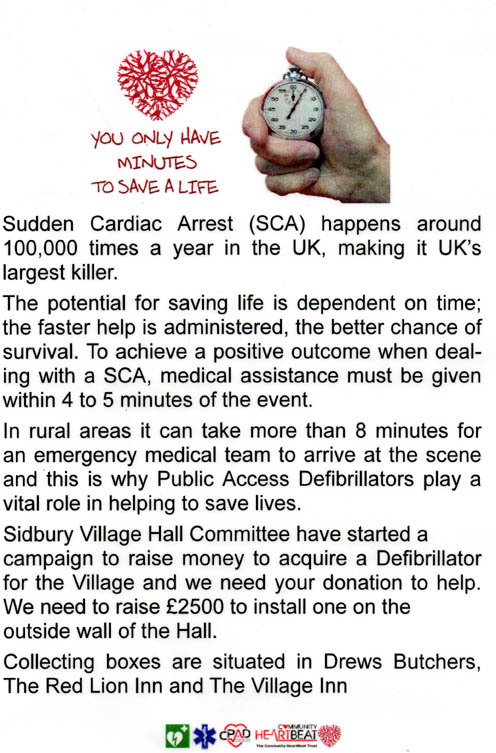 Sidbury Village Hall at 7.00pm. 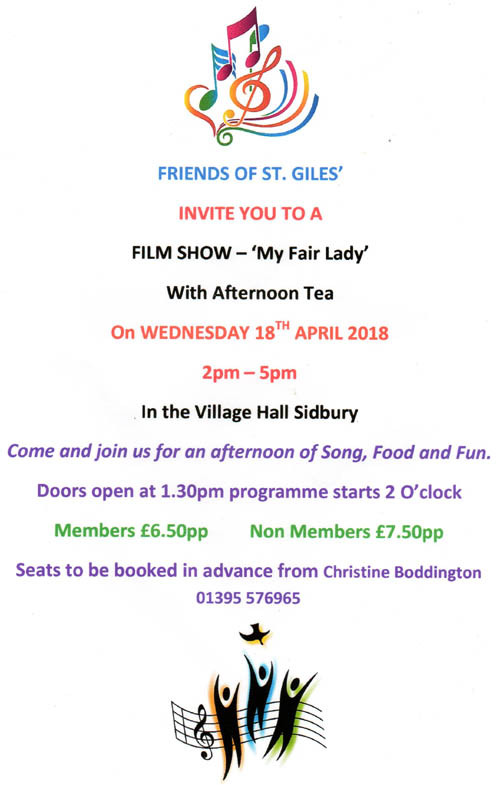 You are invited to join the Friends of St Giles Sidbury at their New Year Luncheon. The applicants who submitted a planning application to build a business park on agricultural land in an AONB, have now submitted an appeal against the decision taken last October by the District Council to oppose their application. The Say NO Campaign is absolutely determined to support the District Council and its rejection of the planning application at the appeal. But to do this we need to engage professional representatives to forcefully make our case against the business park development. 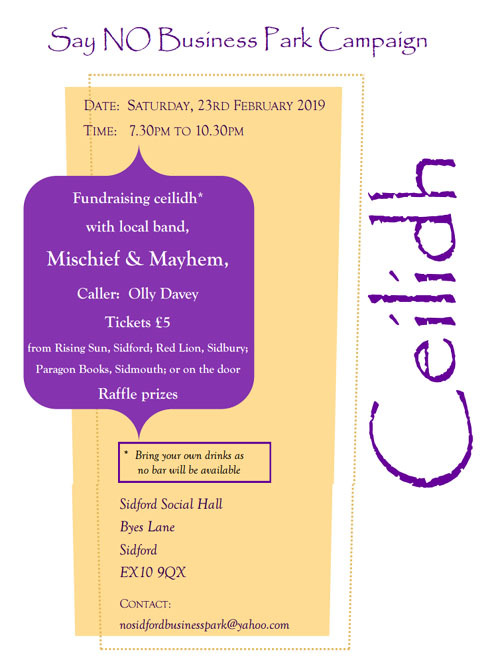 We would remind you of our timely ceilidh fundraising event. A Murder Mystery based on "Midsummer Murders" by Red Herring Games. £12.50 per ticket to include a three course meal. 7.15pm for 7.30pm. Licensed wine bar. Could you spot a Murderer? 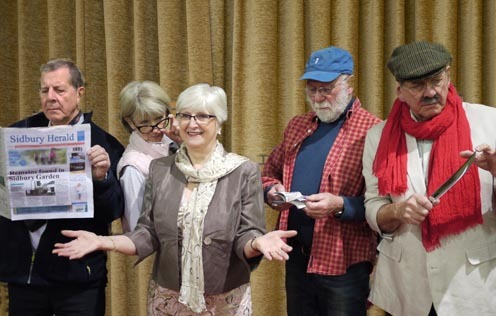 John Loveridge, Sue Hulley, Pam Ward, John White, Gwenan Paewai and Joel Goldenhive play the suspects in Sidbury into Drama's forthcoming Murder Mystery Evening.